Authors’ note: An online version of this article, with 81 color illustrations, is available on the journal’s web site. [e] Readers interested in the full pictorial evidence supporting the views expressed here are encouraged to consult the online version, which was designed by Todd Stabley, Multimedia Consultant, Center for Instructional Technology, University of North Carolina at Chapel Hill. “You shall not bring me down to believe such fitting & fitted I know better & Please your Lordship”1↤ 1. William Blake, annotations to William Wordsworth’s “Preface” to The Excursion. Complete Poetry and Prose, ed. Erdman, 667 (hereafter cited as “E” followed by page number). Over the last thirty years, William Blake’s methods of etching the copperplates of his illuminated books have received more scrutiny than the ways he printed those plates. 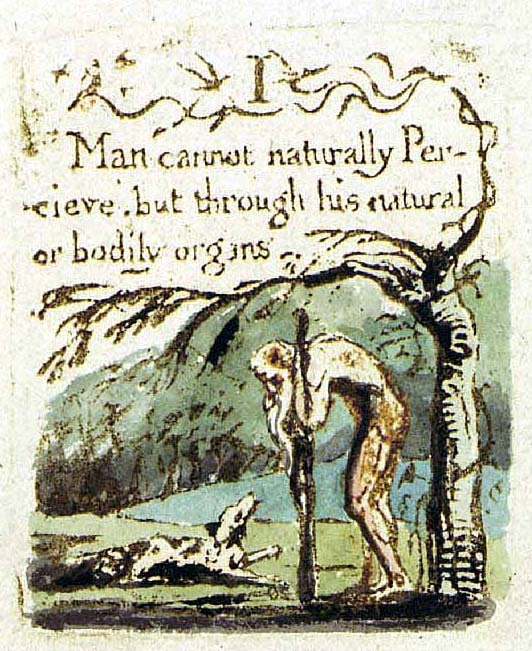 In 2000, however, printing techniques rose to the forefront of attention among the small band of scholars interested in how Blake made his books as the material foundation for interpretations of what they mean. Credit is due to Michael Phillips, for many years a well regarded bibliographic and historical scholar of Blake’s life and works, for raising the issue of Blake’s color printing methods and thereby stimulating the debate we wish to initiate in this essay. Phillips has proposed that Blake created color-printed impressions of his relief etchings by passing them through his rolling press twice, once to print the text in ink and a second time to color print the design on the same sheet of paper. This “two-pull” procedure (as we will call it throughout this essay) differs fundamentally from a “one-pull” procedure, in which the inked text and the colored image are printed simultaneously in one pass through the rolling press.2↤ 2. The one-pull method is described in Essick, Printmaker 125-35, and Viscomi, Idea 119-28. As Phillips (103 and 120n31) points out, W. Graham Robertson (in Gilchrist 404-06) had previously suggested (or at least implied) that Blake used the two-pull method. However, Robertson is addressing only the technique Blake used for his large color prints, first designed and executed in 1795, not the color prints in the illuminated books. Phillips also notes that Martin Butlin was “convinced” (103) of the two-pull theory. Indeed, Butlin at least suggests as much, without explanatory details, in William Blake 48, Paintings and Drawings of Blake 1:156, and “Physicality” 5. Phillips 120n31 also cites Butlin and Gott “p. 111”; but in that section of the catalogue, signed by Gott alone, Gott states explicitly that “both sets of tints” (i.e., the ink and the color-printing medium) were “printed . . . together” in one pull (111). Raymond Lister (not cited by Phillips) implies a two-pull theory in his comment that the color prints in the Large and Small Book of Designs were “colour-printed on the base of impressions from relief-etched plates, instead of being colour-printed from the beginning” (61). The first, prominent appearance of his theory, one that attracted wide attention, was in the catalogue (Hamlyn and Phillips 106-107, 118) and wall labels for the great Tate Britain Blake exhibition, London, fall and winter 2000-01.3↤ 3. The Tate Britain exhibition labels for items 119b and 205 (Lucifer and the Pope in Hell and Visions of the Daughters of Albion frontispiece) implied (as in Lister 61) that color-printed intaglio etchings and relief etchings for the Large and Small Book of Designs were printed in 1794 in monochrome and then reprinted two years later in colors. A few of the labels in the smaller version of the exhibition at the Metropolitan Museum of Art, New York, spring 2001, also at least hinted at the two-pull theory. In the exhibition catalogue sold at both venues, the two-pull theory is described in a straightforward manner that implies it is a generally accepted fact. By far the fullest explanation for the two-pull procedure is presented in chapter 5 of Phillips’ book, William Blake: The Creation of the Songs of Innocence and of Experience from Manuscript to Illuminated Printing (95-108). The museums and publishers presenting the two-pull theory cannot fail to attract considerable respect. It is difficult to imagine more prestigious art-historical institutions than the Tate and the Met. The British Library and Princeton University Press lend similar authority to Phillips’ book. We assume that both publishers solicited the advice, and received the approval, of leading authorities in Blake and the graphic arts. The positive reception of Phillips’ book is indicated by Vincent Carretta’s and K. E. Smith’s glowing reviews in Eighteenth-Century Studies and The Blake Journal respectively. But before the two-pull theory achieves complete acceptance within the community of Blake scholars, we wish to raise some serious reservations concerning its accuracy. We do so within the context of a thorough examination of Blake’s color prints, their minute visual features and the processes that created them, as well as their relationship to the color-printing technologies of the eighteenth century. We will also explain (and question) how the two-pull hypothesis implies a “Blake” very different from the artist, poet, and aesthetic theorist Blake himself portrays explicitly in his writings on the arts and implicitly throughout his graphic productions. Although we disagree strongly with Phillips’ theory, we are grateful to him for bringing to our attention the technical issues and their larger conceptual implications we consider in what follows. As Blake wrote in The Marriage of Heaven and Hell, “Opposition is true Friendship” (E 42). 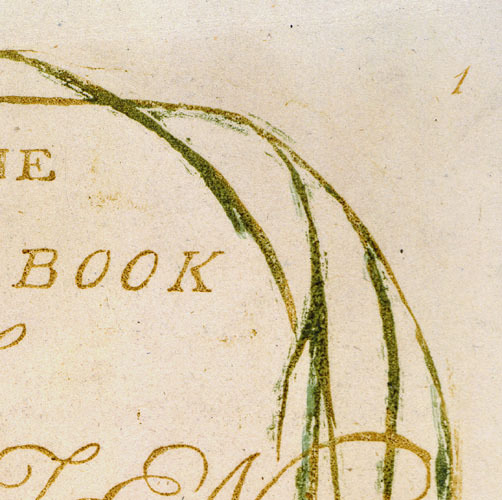 In his prospectus “To The Public” dated 10 October 1793, Blake states that the illuminated books “are Printed in Colours” and identifies “America, a Prophecy,” copies of begin page 75 | ↑ back to top which at that time were printed in bluish- and greenish-black inks and left uncolored, as being “in Illuminated Printing” (E 693). Apparently, what made the books “illuminated” was not colored inks (as distinct from the usual black) on each plate or even the addition of water colors to the impressions, as one of the meanings of the word “illuminate” implies. “Illuminated printing” was created simply by printing from relief-etched plates—that is, from plates produced by the “method of Printing both Letter-press and Engraving” that Blake had “invented,” a mode of printmaking which combined the printmaker with “the Painter and the Poet” (E 692). Features equally distinct were its cost, producing “works at less than one fourth of the expense,” and its ease of use, for Blake believed he had invented for “the Artist, the Poet, the Musician” a means to “publish their own works” that did not require the specialized training of the engraver or typesetter (E 692). Blake claims that etching word and image in printable relief, and doing so in an affordable and accessible way, are the distinguishing features of his new invention. Combining text and illustration on one plate and coloring prints are less significant characteristics. The Gates of Paradise combines words and images but is identified in the prospectus as a “small book of Engravings” rather than a work in “Illuminated Printing” (E 693). Many other printsellers of the day offered colored prints.4↤ 4. How Blake identified The Book of Ahania (1795) and The Book of Los (1795), in which the text pages were printed from intaglio plates, is not known. Today they are routinely classified as illuminated books, perhaps because of their color-printed frontispieces, title pages, and vignettes. All copies of Gates, however, were printed in black ink and left uncolored. Nevertheless, five of the six books listed in the prospectus as being “in illuminated printing” (E 693) were indeed printed in colored inks, usually yellow ochre, raw sienna, or green, but only in a single color on any one impression. Blake would print a few copies of each book in one printing session, often changing ink during the session for those books in print runs of more than ten copies (e.g., Songs of Innocence, The Book of Thel, and Visions of the Daughters of Albion) to diversify the copies, and had by this time printed approximately 62 copies of the six titles (Viscomi, Idea 376). Nearly all the pages making up these copies were finished in water colors. The coloring style was very simple, with just a few light washes in the images and rarely in the text areas. Blake adapted a standard practice for coloring prints, “washing” (i.e., painting in transparent water colors) sets of them with his assistant, his wife Catherine, before they were assembled as pages in books. The practice of coloring prints was a small cottage industry in England at this time (the colorist usually adding only one or two colors before passing the print to the next colorist, who adds her colors), and all the major printsellers, such as John and Josiah Boydell, Thomas Macklin, and James Sayers, offered separate prints both monochrome and colored. No one but Blake, however, offered works in “illuminated printing,” and no one but Blake was producing colored prints as illustrated text pages in books. By the fall of 1793, the illuminated books consisted of two kinds of relief-etched prints, monochrome and colored.5↤ 5. Monochrome impressions, whether printed in shades of black ink, such as those in most copies of America (and, later, Jerusalem) or in colored inks, such as those in The Marriage of Heaven and Hell copy B (1790) and the Experience section of Songs of Innocence and of Experience copy O, were produced and sold as monochrome copies and should not be considered unfinished. Copy designations and plate numbers for the illuminated books follow Bentley, Books. Blake added a third kind of print around this time, one also very popular with the printsellers. This was the color print, which differs from a colored print in that the colors came primarily, though not exclusively, from the plate along with the ink. Indeed, beginning in the mid-1780s, stipple prints, mezzotints, aquatints, etchings, and engravings printed in colors and finished by hand on the individual impressions in water colors formed an enormous part of the print industry. The color printing method used in England, invented by Robert Laurie in 1776, used brushes with their tips cut off (a procedure which stiffens the remaining parts of the bristles) or small dabbers (bundles of fabric) to apply colors to the incised lines of intaglio plates.6↤ 6. Laurie’s method combined on one plate mezzotint, stipple, and, for the outlines, etching, which he inked warm with camel hair brushes with their tips cut off to form stump brushes. He was awarded 30 guineas by the Society of Arts in 1776 for the invention of this color printing method (see Burch 87 and Hardie 56-57). The method was called “à la poupée” (“with the doll”) because the dabbers resembled small “poupées,” or rag dolls. À la poupée printing was essentially painting the plate, which required a high level of artistic skill on the part of the printer in applying the ink and wiping the plate’s surface. In effect, the technique produced monoprints, since the plate could not be identically inked for each pull through the press and thus no two impressions were exactly alike. 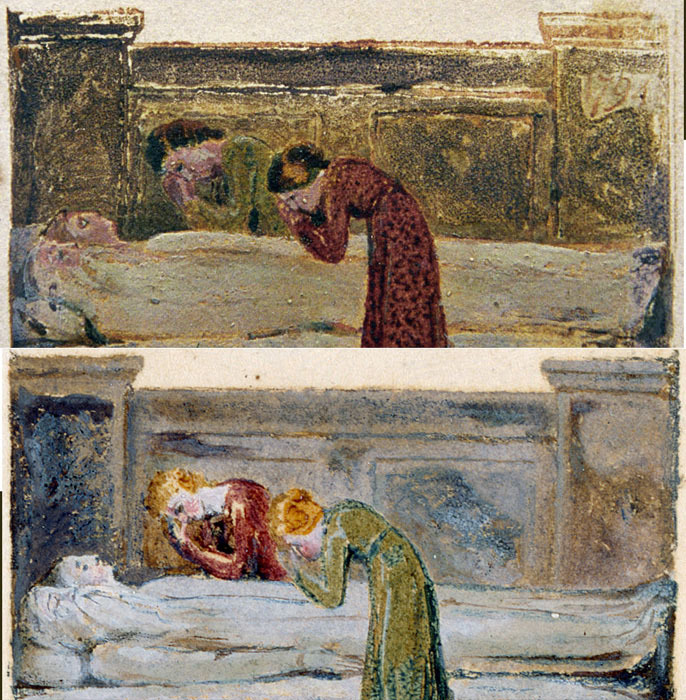 Given the coloring technique, it was impossible for any two such prints to be identical, and because the “cheap drudges” employed by the printsellers to “execute this delicate and difficult task” of finishing them in water colors lacked the “practised hand, the cultivated eye, and the consummate judgment of a master,” the resulting “performances must ever remain unworthy [of] the attention of those who possess the smallest pretensions to Taste.”9↤ 9. Landseer 182-83. He goes on to claim that only “the eye, the hand, and the judgment of a Painter, can alone confer value on a coloured work of art—call it picture, print, or whatever you please: nothing else can entitle it to the denomination of a work of Art.” Finishing, of course, also required the “genuine Painter, who (even were he to be well paid for it) could never submit to stifle his inventive powers in the drudgery of copying his own works, while by multiplying them, he lessened the nominal value of each” (183). Landseer’s criticism is harsh and biased, the view of the outsider angry about the engraver’s lowly status as copyist—as well as about losing his market share to tonal and color printmakers. Yet, he does point to the inherent difficulty of color printing à la poupée. Industrious Cottager, a stipple and line engraving by Blake after George Morland, was color printed in three or four colors, the industry’s standard. The printer was almost certainly not Blake, but rather a professional plate-printer adept at such work. As with all such color prints, Industrious Cottager demonstrates how one ink color modulates or blends into another, with little overlapping, and why great care and skill was required to keep the inks from mixing when wiping the surface of the plate. It also shows how delicately the print was finished in water colors. Good color prints (and they had become quite common, pace Landseer) were more expensive than colored prints because the initial painting of the plates required skilled artisans (rather than “cheap drudges”) and was more labor intensive than washing prints by hand. Blake’s stipple and line engravings after various artists, published by Macklin, cost approximately twice as much colored as plain. Morning Amusement, for example, was advertised in Macklin’s 1794 catalogue at “7s.6d. Plain, and 15s. in Colours” (70). The alternative to printing multiple colors on one plate in a single pull through the press was to print multiple plates, all the same size, with each plate carrying one color and all the plates registered in exactly the same position on the paper. Landseer does not comment on multiple-plate color prints, probably because they were exceedingly rare. No one in England was using the technique in the 1790s, and only a few printers on the Continent were. But given that the technique was invented to produce prints that looked even more like their models than color prints produced in one pull through the press, he would have certainly disapproved. Nor would Landseer have been appeased by the separation of colors and the elimination of the need for the printer to be “an artist,” or even by impressions not having to be subjected to the hand-colorists, those “ignorant pretenders to Art . . . the cheap drudges . . . who can scarcely hold a pencil” (182). These, however, are the features that made multiple-plate printing more mechanical and thus more able to produce numerous and near-identical prints (Lilien 83). In other words, multiple plates were not only a way to ensure consistency, but also a way to eliminate the painter from the reproduction of paintings and drawings. The first color printing using multiple plates was “chiaroscuro” woodcuts in imitation of tinted drawings common in the Renaissance. Line drawings on tinted paper with highlights in white gouache (an opaque watercolor, sometimes called “body color”) were reproduced with a key or outline block and a second block cut in the broad shape of the wash with selected areas cut out so that the white of the paper would serve as the highlights (the so-called “German” type). To reproduce wash drawings in which the tints and highlights define both outline and modeling required reducing the drawing to three or four tints and cutting separate blocks for each, with highlights cut away from the blocks. The tone blocks overlapped to create intermediate tones (the “Italian” type). Chiaroscuro woodcuts were produced primarily in Italy and Germany in the 16th and 17th centuries, and eventually in France and the Netherlands. English engravers, however, did not learn the process until the early 18th century, and even then it was rarely practiced (Friedman 3). The few English engravers who produced chiaroscuro prints (e.g., Charles Knapton, Elisha Kirkall, and Arthur Pond) used mezzotint or etched plates as the key plate and wood blocks for tones and highlights, a mixed-method technique begin page 77 | ↑ back to top that was first used by Nicolas Le Sueur in Paris for Crozat’s Cabinet (1741), a collection of prints in imitation of old master drawings. Kirkall’s The Holy Family, a mezzotint and chiaroscuro (1724), exemplifies this type of color print. The best known and most accomplished chiaroscuro woodcut printer in England was John Baptist Jackson (1701-77? ), who executed prints in imitation of drawings, as well as 24 paintings by Venetian masters, including Titian, Veronese, Tintoretto, and Jacopo Bassano. The Descent from the Cross after Rembrandt (1738) is one of Jackson’s best works. In 1754, he published An Essay on the Invention of Engraving and Printing in Chiaro Oscuro, which contains the first color-printed book illustrations in England in the eighteenth century (all previous were separate prints), and served as a publicity venture for his new use of chiaroscuros, printing wallpapers. The wallpaper firm failed in 1755 and Jackson disappeared from the printmaking scene.10↤ 10. The first book in England with color prints was the Book of Hawking, Hunting, and Heraldry, printed in 1486 in St. Albans, Hertfordshire (Friedman 4). Jackson’s was technically the second book in England with color prints. In the latter half of the eighteenth century, aquatint plates with etched outlines replaced the key and tone blocks, making the facsimilizing of wash drawings a relatively simple one-pull procedure, as Richard Earlom’s facsimiles of Claude Lorrain’s and Giovanni Cipriani’s drawings attest. French graphic artists like Gilles Demarteau used the chiaroscuro method with aquatints (and other plates) to produce prints in imitation of paintings (as distinct from wash drawings). An earlier and even more intriguing venture in multiple-plate color printing also failed. Jacques Christophe Le Blon (1667-1741), who was trained as a painter and engraver, invented a way of “printing pictures” (Le Blon 6) using three mezzotint plates, each printed in one of the primary colors (red, yellow, blue, with occasionally a fourth plate in black) and registered on the paper to reproduce all the compound colors of the original drawing or painting. His first color prints were produced c. 1704; in about 1720, he came to England where mezzotints, which are ideally suited for reproducing the tonal gradations characteristic of oil paintings, were far more popular than on the Continent. He formed “The Picture Office,” a company to produce and sell color prints, including the Van Dyck Self Portrait (c. 1720), a three-color mezzotint, but it quickly ran into financial problems because Le Blon sold his color prints for 10 to 15 shillings while their production cost more than a pound (Friedman 9). The technique was inherently expensive, requiring at least three copperplates for each image and a similar (or probably greater) multiplication of labor costs. Le Blon went bankrupt and returned in 1732 to Paris, where he continued to work on his mezzotint process with little financial success. 1. William Blake, There is No Natural Religion copy C, plate a4. Relief etching, 5.2 × 4.2 cm., etched 1788, color printed c. 1794. Lessing J. Rosenwald Collection, Library of Congress. Rudimentary color printing is present on the left hip and thigh of the standing figure. attempting to understand the theory of color, and that the invention assisted him in that understanding “till [he] arriv’d at the Skill of reducing the Harmony of Colouring in painting to Mechanical Practice, and under infallible Rules” (iv). Le Blon’s invention anticipates modern color separation, but he did not have the aid of cameras and optical filters to analyze the colors of a painting into the primary colors. This he did by eye and trial and error till he achieved the correct proportions of each color. He likened his theories about the mixture of “Material Colours” to Isaac Newton’s theories in the Optics on light, or “Impalpable Colours” (Le Blon iv). Although Le Blon’s three-color mezzotint process was not used in England after he returned to Paris, it was well known. Robert Dossie, in the Handmaid to the Arts (1758), described the technique and noted that it would remain “neglected . . . unless revived by the patronage of some great person or society, who may conveniently bear that expence, which artists . . . cannot prudently engage in” (2:185-86). The method was, however, continued in Paris by a few of Le Blon’s pupils. The best of them, Jacques Fabian Gautier D’Agoty, produced work that “shows a marked superiority to Le Blon’s,” particularly evident in his prints for Myologie complette of 1746 (Friedman 10). Printing multiple colors from one plate was the standard practice for producing color prints during Blake’s lifetime begin page 78 | ↑ back to top for good reason: it produced results closer to actual paintings than hand-colored black and white prints, and it cost less than any of the multiple-plate techniques. To summarize the two basic processes: in à la poupée printing, the plate is painted anew for each impression, which is then finished in water colors; in multiple-plate printing, each plate is inked in only one color, and the plates are registered to overlap in the impression to reproduce the secondary and tertiary colors and tones. The former requires a painter’s touch and mind; while the latter, dedicated to producing identical impressions, requires the eyes and hands of a printer skilled at registration. The color prints Blake produced, between 1794 and 1796 but a few as late as c. 1808 (e.g., Jerusalem proofs and a handful of plates in America copy M have more than one color printed from the plate), range from very simple to very elaborate, from one or two colors applied to relief areas only, as in plate a4 of There is No Natural Religion copy C (illus. 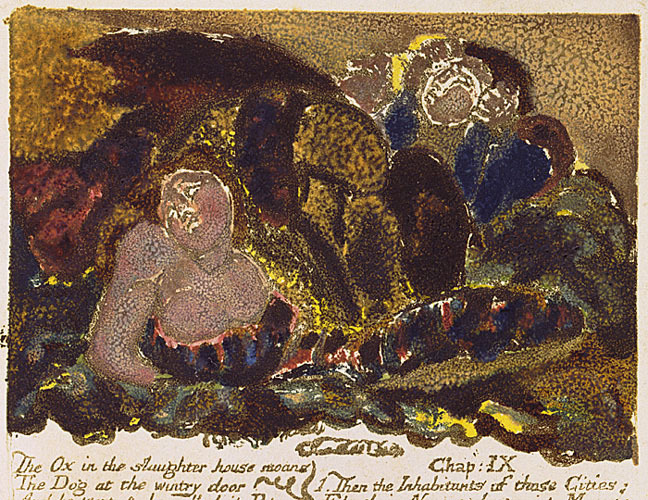 1), to colors applied to both relief plateaus and etched shallows, as in plate 18 of The First Book of Urizen copy C, where Blake also used different colored inks for text and illustration. Blake also color printed relief etchings without text, such as the full page illustrations in The Book of Urizen, and intaglio works, such as Albion rose. His color prints reflect a printmaker far less orthodox than Landseer or any other of his period, and far more the artist (rather than the precision mechanic) in the print studio and in his thinking about graphic art. He was as angry as Landseer and others about engraving being dismissed as mere copywork, but instead of attempting to sensitize his audience into seeing dots and lozenges as a virtuoso performance/translation in metal, Blake deployed another strategy. He erased the grounds for hierarchies in the arts by reducing both painting and engraving to “drawing” and asserting that “he who Draws best must be the best Artist” (E 582), and by producing prints whose aesthetic originality was stunning and even, as with the white-line etching of Deaths Door and many of the color prints, confrontational. He showed how prints could be as original and unique as drawings and paintings, as creative as the works normally imitated in prints. This new “method of Printing both Letter-press and Engraving” (E 692) did more than combine—or etch into printable relief—text and image. When Blake printed in colors, his relief-etched copperplates offered two different printing surfaces, relief and intaglio, that he fully exploited as an artist, creating color images unlike any ever seen before, such as the pages in The Song of Los copies A-F (illus. 19), The Book of Urizen copies A, C-F, and J, The Marriage of Heaven and Hell copies E and F (illus. 9), and Visions of the Daughters of Albion copies F and R. It is in color printing that his “method of Printing” fully met and joined with the art of the “Painter” (E 692). Blake’s colors were opaque, water-miscible paints in which pigments were most likely mixed with water into a paste and then ground with a vehicle of warm, diluted “size” (glue) or a gum with the physical properties of glue (Essick, Printmaker 126-28, 259-60; Viscomi, Idea 121). Mixing this vehicle with a little ox gall and hydromel (honey and water), ingredients used to keep gum arabic-based water colors moist, would have helped to retard the drying action of the paint.11↤ 11. There was an inherent limit to the amount of time Blake could spend on preparing the plates for color printing. Unlike ink, water-soluble colors, even those mixed with a retardant, would have dried on the plate had Blake dawdled. What Blake said in his “Public Address” about drawing, that it required a “firm and decided hand” working “at once” (E 576), was true not only of drawing the plate image but of printing in multiple colors. The hand “which Doubts & Hesitates in the Midst of its Course” (E 575) will fail to produce the best possible image. By degreasing the copper with a solvent, Blake could keep the paint from beading up, and thus also help the colors to transfer from metal to paper. Blake’s departure from conventional color printing was in printing two surfaces of the plate as well as using—on the same plate at the same time—both oil-based inks and water-miscible paints. Actually, Blake combined oil with water not only when printing inked plates with size-color, but also when printing on dampened paper (the standard practice for all plate-printers) and when washing or painting prints in water colors, which was “a prime function of water color wash for five hundred years” (Cohn 11). 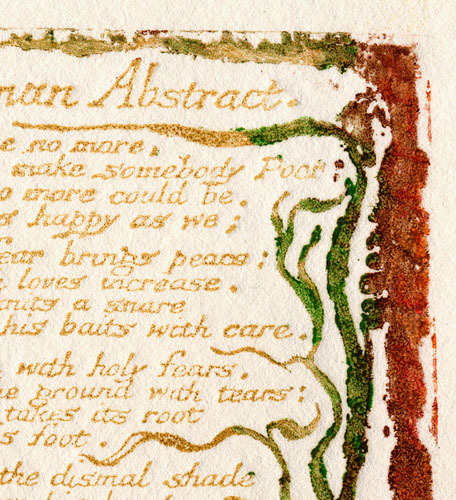 Size-color can be placed on the plate along with oil-based ink, thereby making it possible for Blake to print both inked text and colored designs simultaneously. Blake could wash the resulting impressions in water colors because size-color is insoluble once dry, and thus not disturbed by being re-wetted. The mottled or reticulated texture so typical of his color prints was caused partly by the paper pulling away from a buttery size-color on the plate, and partly by the water colors interacting with an oily surface and attaching to the exposed paper where the ink had reticulated. The surface tension between the oil-based ink and water-based paint was also deliberately manipulated to create various types of tactile surfaces.12↤ 12. According to J. T. Smith, writing in 1828, “Blake’s coloured plates have more effect than others where gum has been used,” because they “are coloured . . . with a degree of splendour and force, as almost to resemble sketches in oil-colours” (Bentley, Records, 473, 472). Smith based his assertions on works like “Albion rose,” which was one of “those beautiful specimens [the Small and Large Book of Designs] . . . coloured purposely for . . . Ozias Humphry” (Bentley, Records, 473). Smith’s opinion that the opaque colors characteristic of Blake’s color printing are more “beautiful” than the transparent tints characteristic of water color drawings (which he equated with their binder, gum arabic) reflects the then fashionable taste for water colors in “imitation of the effect of oil painting . . . the explicit desirability” of which was “the bellwether of a new consciousness of the changing potential of water color art” (Cohn 11). 2. William Blake, “Nurses Song” (Experience). Relief etching, 11.1 × 6.9 cm., etched 1794, color printed and finished in watercolors and pen and ink 1794. Songs of Innocence and of Experience copy E, 1789/1794, with additional washes c. 1806. Huntington Library. 3a. Jacques Fabian Gautier D’Agoty. Myologie complette en couleur et grandeur naturelle, Paris: Gautier, 1746, plate 3. Three-color mezzotint, 40.2 × 32.3 cm. Huntington Library. Detail, top right corner, showing evidence of second plate and one of four pinholes. The misaligned plate creates the appearance, in this monochrome reproduction, of a gray border line along the right margin of the darkly printed image. 3b. Jacques Fabian Gautier D’Agoty, Observations sur l’histoire naturelle, sur la physique et sur la peinture, 6 vols., Paris 1752-55, Tortuise, Observation XII. Three-color mezzotint, 20.5 × 14.6 cm. Yale Center for British Art, Paul Mellon Collection. Detail, bottom right corner, showing evidence of second plate. As in illus. 3a, the misaligned plate creates what appears as a gray border line in this monochrome reproduction, but in this instance along the lower border of the image. text (first pull) and illustration (second pull) to reunite them on paper if it was technically and aesthetically unnecessary to do so? According to Phillips, Blake produced his color prints by inking the plate’s text areas, registering the paper to plate, printing and removing the paper, wiping the ink off the plate, adding colors, registering the paper exactly to the colored plate, printing and removing the twice-printed paper from the bed of the rolling press, and (presumably after drying) finishing it in water colors (95, 101, 107). To produce another print from the same copperplate, Blake would then begin the process anew by wiping the plate of its colors, inking the text areas, registering, printing, wiping the ink, adding colors, registering, and finally printing. Phillips claims that a significant part of his evidence for this labor-intensive method in which text is printed first and illustration second lies in the “Nurses Song” from Songs of Experience in Songs of Innocence and of Experience copy E (illus. 2). One can plainly see that this impression was indeed printed twice, as Essick and Viscomi separately recognized, but which they, according to Phillips, incorrectly identified as an individual aberration rather than as one of the most significant clues in revealing Blake’s color printing practice (Essick, Printmaker 127; Phillips 103; Viscomi, Idea 119). Phillips implies that this “Nurses Song” deviates from other color prints only in that, unlike them, it is misregistered, whereas all the other extant color prints were perfectly registered. 4a. Louis Bonnet, Head of a Young Girl Turned toward the Left. 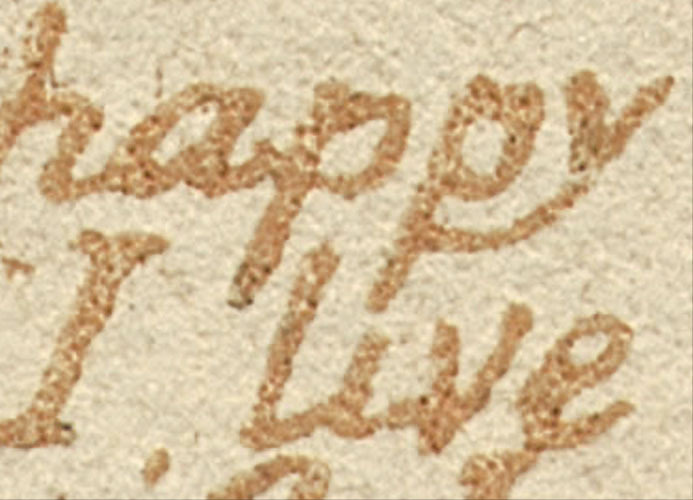 Two-color stipple, 1774. Yale Center for British Art, Paul Mellon Collection. Detail, bottom left corner, showing the platemarks of two plates and a pinhole in the framing line. 4b. John Baptist Jackson, Holy Family and Four Saints, after Veronese. Chiaroscuro woodcut, 56.0 × 34.5 cm., 1739. Yale Center for British Art, Paul Mellon Collection. Detail, bottom right corner, showing yellow tonal block (represented in this monochrome reproduction as a gray tone) extending below the outline of the very dark key block. meant that “the precision of the registration had to be absolute” (96). From this statement, one might infer that Le Blon’s color prints show no signs of the second or third plate—that is, reveal no signs of their mode of production—but that one plate was registered on top of an impression from the other so precisely that all telltale tracks were covered. That, however, never happens. 5a. “Infant Sorrow.” Line block cast from electrotype, 11.1 × 7.0 cm., printed 2001 by authors. Detail of text. Plate was printed twice and is slightly out of focus in text. 5b. “Infant Sorrow.” Line block cast from electrotype, 11.1 × 7.0 cm., printed 2001 by authors. Detail of illustration. Plate was printed twice and is slightly out of focus. Holy Family and Four Saints, after Veronese (1739), demonstrates (illus. 4b). In all of these illustrations, it is fairly easy to see the misregistrations. Such subtle misregistrations are not signs of poor printing. They are to be expected, as printing manuals today acknowledge, regardless of the registration mechanism used, because damp printing paper stretches and shrinks in the course of printing the first and subsequent plates (Hayter 58, Romano and Ross 121, Dawson 100). Reviewing the various techniques used in his Atelier 17 for registering and printing multiple plates, Hayter, one of the greatest technicians of twentieth-century printmaking, states that “it is worthy of note that none of these methods is absolutely precise” and “examination of the edges of colour prints made by this system [i.e., multiple plates] will nearly always show some errors of registration between the different colours . . . ” (58). Slight misalignments, however, will not disrupt the visual logic and impact of the design; our eyes tend to make adjustments or “read” a slight fuzziness in an image as a pleasingly painterly style. The visual effect of multiple-plate color prints, in other words, was not dependent on absolute precision but on colors being overlaid one on top of the other. But the same eyes cannot be fooled when focused on the margins. “Absolute” (Phillips 96) accuracy in registration was impossible.13↤ 13. J. F. Gautier D’Agoty’s Myologie has plates measuring 30 × 40 cm. to 66 × 46 cm. Every impression in the two copies we examined revealed signs of registration at the corners. The same is true of the eight plates in his Anatomie, measuring from 32 × 40 cm. to 40 × 54 cm., and 53 of the 63 plates color printed in his Observations, averaging 20.5 × 14.6 cm. ; it is also true of the 15 plates in Cours complet d’anatomie, by A. E. Gautier D’Agoty, measuring 40 × 55 cm., which, according to Burch, are examples of color printing at its best (63). We found the same to be true of every color-printed impression we examined in the Huntington Library and Art Gallery (San Marino, California), the Metropolitan Museum of Art (New York), the Yale Center for British Art (New Haven, Connecticut), and the Ackland Museum (Chapel Hill, North Carolina). These collections include works by Le Blon, Louis Bonnet, J. B. Jackson, Nicolas Le Sueur, Arthur Pond, Elisha Kirkall, Charles Knapton, Gilles Demarteau, Hubert Goltzius, Ugo Da Carpi, J. B. M. Papillon, Jean Francoise Janinet, and Philibert Louis Debucourt. [e] Even the color prints by Pablo Picasso on display at the Museum of Modern Art (New York) showed signs of the second pull. Misregistration and multiple platemarks in color prints are visible in good reproductions in books (see color plates I, II, IV in Friedman and color illustrations 46, 48, 52, and 57 in Lilien). Most reproductions, however, including those in Phillips’ book, are trimmed to the image, thereby hiding the evidence of multiple printing. 6. “Infant Sorrow.” Line block cast from electrotype, 11.1 × 7.0 cm., printed 2001 by authors. Plate was printed twice and appears perfectly registered to the naked eye—but see illustration 7a. 7a. “Infant Sorrow.” Line block cast from electrotype, 11.1 × 7.0 cm., printed 2001 by authors. Detail. Image in illustration 6 looks fine to the naked eye, but when magnified it reveals ghosting around the letters created by one plate printed on top of itself. 7b. “Infant Sorrow.” Line block cast from electrotype, 11.1 × 7.0 cm., printed 2001 by authors. First impression of five from a plate inked once in black ink. Detail. 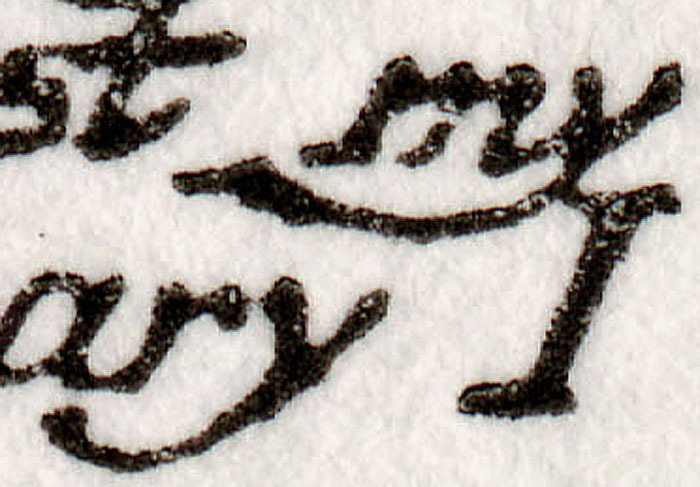 Magnification of the letters of a plate printed once reveals sharp forms and the absence of ghosting. 8a. William Blake, “The Fly.” Relief etching, 11.8 × 7.3 cm., etched 1794, color printed and finished in watercolors and pen and ink 1794. Songs of Innocence and of Experience copy G, 1794. Collection of Robert N. Essick. 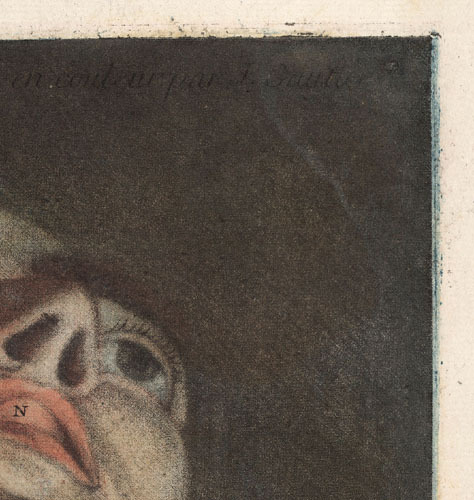 Detail of the letters of a plate color printed by Blake reveals sharp forms and the absence of ghosting. 8b. William Blake, “Nurses Song” (Experience). Relief etching, 11.1 × 6.9 cm., etched 1794, color printed and finished in watercolors 1794. Songs of Innocence and of Experience copy F, 1789/1794. Yale Center for British Art, Paul Mellon Collection. Detail of top right corner showing embossment of wiped border. edges along the letters that evince a second printing (illus. 7a). In impressions printed once, letters and other relief lines do not have any such ghosting (illus. 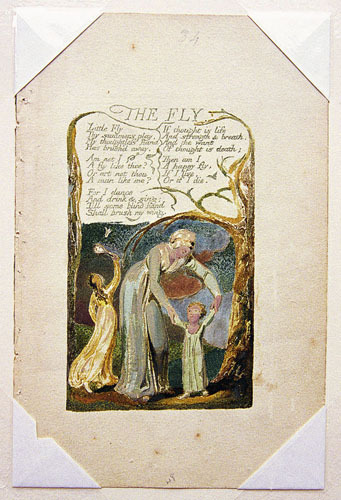 7b), an absence characteristic of Blake’s color prints, as is demonstrated by details of “The Fly” and “Holy Thursday” (Experience) from Songs of Innocence and of Experience copies G and E (illus. 8a, 30) respectively. 9. William Blake, The Marriage of Heaven and Hell copy F, plate 21. Relief etching, 15.3 × 10.8 cm., 1790, color printed and finished in watercolors and pen and ink c. 1794. The Pierpont Morgan Library, New York. PML 63935. Detail of embossment of relief lines into the paper, caused by pressure sufficient to print from the shallows and relief simultaneously, and of the fine white lines between shallows and relief lines caused by the paper not picking up the color from the escarpments between relief plateaus and etched valleys. 10a. “Infant Sorrow.” Line block cast from electrotype, 11.1 × 7.0 cm., printed 2001 by authors. Detail. Plate was printed twice, first with ink and then without ink; the second printing shows up under magnification as a slightly embossed halo around inked areas. 10b. William Blake, “The Lamb.” Relief etching, 11.9 × 7.7 cm., etched 1789, printed and finished in watercolors 1789. Songs of Innocence copy G, 1789. Yale Center for British Art, Paul Mellon Collection. Detail of bottom margin showing traces of ink on and along border wiped of ink. 11. “Infant Sorrow.” Line block cast from electrotype, 11.1 × 7.0 cm., printed 2001 by authors. Detail. Text of third impression printed from a plate inked once in black ink is light but perfectly legible and acceptable. Daughters of Albion copy F, and The Marriage of Heaven and Hell copy F, as is clearly evident in its plate 21 (illus. 9). If Blake printed his plates twice with pressure sufficient to print colors from the shallows, then the second printing, despite its carrying no ink, will reveal itself as a set of embossed lines around the printed lines (illus. 10a). No embossments or haloes of this kind are found in Blake’s color prints.14↤ 14. 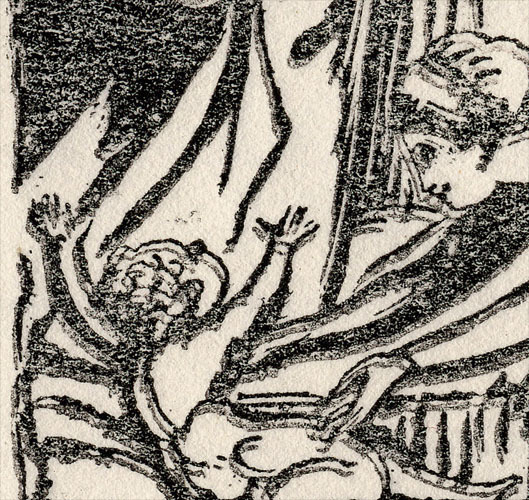 While it is possible to print an impression by rubbing the back of a sheet of paper lying on an inked relief-etched plate (though not for those sheets printed on both sides), to print from both levels and create the kinds of even embossments we see in The Marriage of Heaven and Hell copy F requires a rolling press. One of the labels in the Tate Britain exhibition, item 117c, suggested that Blake may have printed his plates with his hand. Phillips claims that, in two-pull color printing, Blake may not have passed “the plate and impression through the rollers a second time,” but printed by “carefully applying pressure with the tips of his finger” (Phillips 102) or “by using the palm of his hand” (Phillips in Hamlyn and Phillips 106). Ruthven Todd also argued that Blake’s color prints did not require a press, believing, incorrectly, that the colors would have been badly smeared had they gone under the rollers (37). Colors applied to surface areas often did smear beyond the platemark, as in the frontispiece to Visions of the Daughters of Albion copy F.
12. William Blake, The First Book of Urizen, plate 25, relief etching, 16.3 × 10.3 cm., etched 1794, proof impression color printed 1794, touched with yellow watercolors. Beinecke Library, Rare Books and Manuscripts, Yale University. Detail, showing image printed in colors and before being finished in watercolors and pen and ink, and showing the white lines along the escarpments between shallows and relief areas. 13. 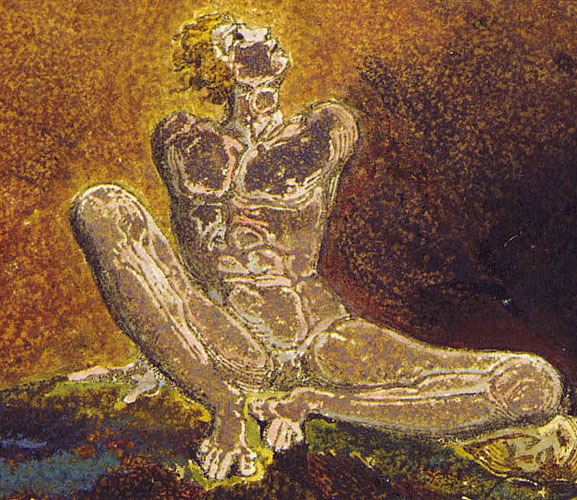 William Blake, The First Book of Urizen, plate 25, relief etching, 16.3 × 10.3 cm., etched 1794, proof impression color printed 1794. Keynes Collection, Fitzwilliam Museum. Second impression from plate that produced the Beinecke Library impression (illus. 12) without its being reinked or recolored. Detail. The colors replicate those in the first impression but are lighter and thinner, and the white lines along the escarpments between shallows and relief areas are more pronounced. copy E, one can produce at least two acceptable impressions (illus. 35a-c). The pigments, oil, and glues used to make inks and colors cost money, and so do rags used to wipe the plates clean. 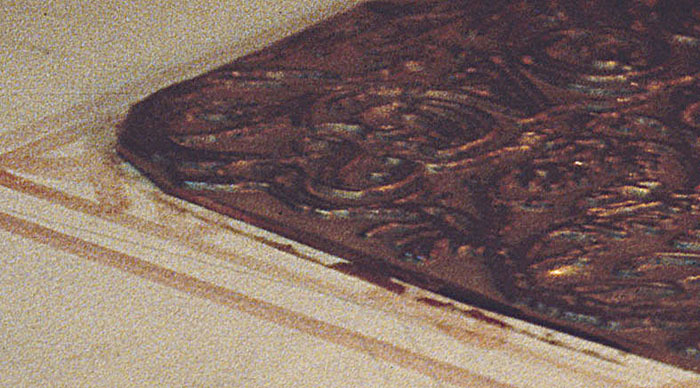 These unnecessary expenses and the time required to clean oily ink and glue-based colors from the copperplates between each impression make this method of color printing expensive and labor-intensive for no aesthetic gain, for it creates prints without any visual differences (other than the telltale signs of double printing) from those produced with single pulls at far less effort and cost. But one need not argue the point hypothetically about labor, time, money, and materials, or even about the astonishing absence of fuzzy impressions, ghost texts, and embossed haloes unavoidable in two-pull printing. To this negative evidence that argues against the two-pull hypothesis we can add a wealth of positive evidence that Blake did not wipe his plates of ink or color between pulls but continued to replenish the ink and colors. Printmakers are led by the physical properties of their materials to replenish ink instead of wiping and starting over again because ink transfers best once the plate is worked up. The repetition of inking accidentals and colors in sequentially pulled prints, such as the two proof impressions of The Book of Urizen plate 25, color printed but not finished in watercolors (illus. 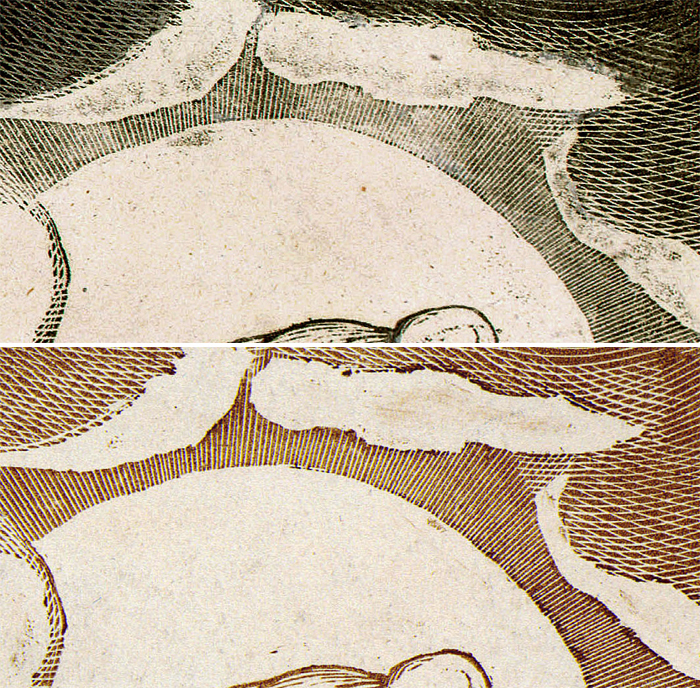 12-13), or the finished impressions of plate 24 in copies F and C, demonstrates that Blake printed more than one impression from an inked plate and added ink and colors to a pre-existing base.15↤ 15. By “accidentals” we mean the accidental inking or coloring of etched valleys, smudges of ink or color printed along the relief escarpments or the edges of the copperplates, diminishing amounts of ink or color on letters and pictorial motifs, and other mere accidents of inking (sometimes called “foul inking”) and color printing that do not intentionally contribute to the printed image. 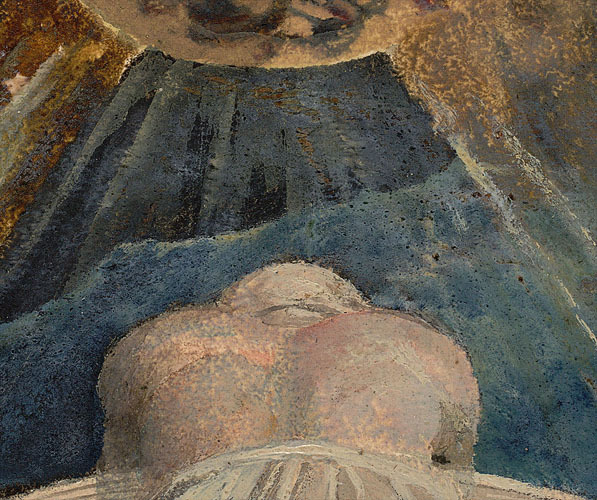 The vast majority of Blake’s relief etchings contain at least minute examples of such flaws. For examples from The Song of Los and how they indicate sequential printing without wiping, see Dörrbecker 320-21; Essick, Printmaker 128-29; and Viscomi, Idea 287. For sequential printing without wiping in Blake’s color-printed separate plates, see Essick, Separate Plates 25, 32, 44. For the sequential printing of the large color prints, first designed and executed in 1795, see Butlin, “Physicality.” To assume otherwise is to assume that repetition of colors and their placement was due to Blake trying to replicate the previous impression—i.e., reproducing a model—but, given the differences introduced, doing a very poor job of it. Clearly, it is more reasonable to conclude that the repetition of accidentals is due to Blake not wiping the plate clean between impressions than to conclude that he minutely copied irrelevant and even visually disruptive droplets and smudges of ink or color, using the prior impression as his model. The repetition of colors, and in some cases their diminishing intensity because Blake did not add more color for a second impression, lead to the same conclusion. Even the impression of “Nurses Song” that was printed twice, the very grounds for the two-pull hypothesis and for thinking that text and illustration were printed separately, shows two top plate borders in yellow ochre ink (illus. 14), which means that ink was printed with the colors and not wiped between pulls. 14. William Blake, “Nurses Song” (Experience). Relief etching, 11.1 × 6.9 cm., etched 1794, color printed and finished in watercolors and pen and ink 1794. 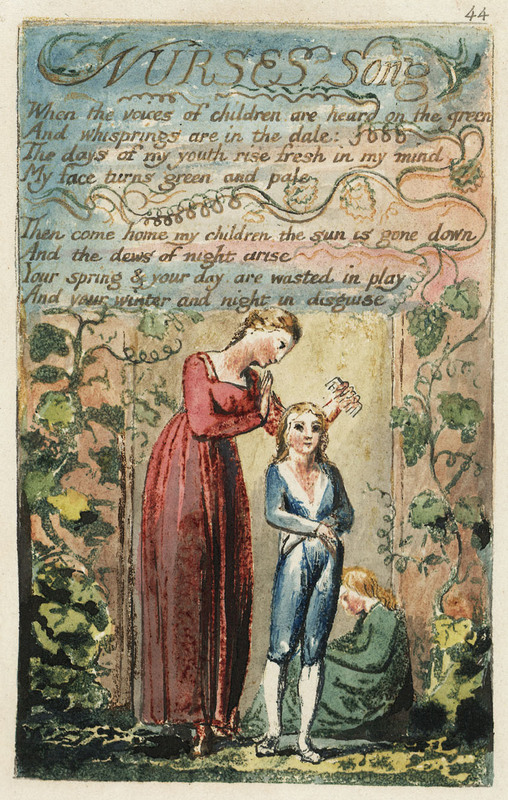 Songs of Innocence and of Experience copy E, 1789/1794, with additional washes added c. 1806. Huntington Library. Detail of top left border showing two plate border lines. between the colors printed from the shallows and the ink printed from the relief surfaces are created by printing pressure that was insufficient to force the paper onto the escarpments between the etched valleys and the relief plateaus of the copperplate. Thus, the paper could not pick up any ink or color from those bordering escarpments. We see precisely the same effect in monochrome, ink-only prints, which no one doubts were printed in one pull, such as Europe copy H plate 1 (illus. 15a). In these impressions, the inking dabber accidentally inked the shallows along with the relief areas, and both were printed simultaneously. The fine white lines between relief and recessed areas were created either by the dabber not depositing any ink on the escarpments or by the paper not creasing at an angle sharp enough to pick up any ink from those escarpments, in spite of relatively heavy printing pressure. The effect in plate 1 of Europe copy H (illus. 15a) becomes clearly evident when compared with an impression of the same plate which lacks the accidental deposits of ink in the etched shallows (illus. 15b). 15a. (top) William Blake, Europe a Prophecy copy H, plate 1. Relief etching, 23.4 × 16.7 cm., etched 1794, printed 1795. Typ 6500 41 (A)F, Department of Printing and Graphic Arts, Houghton Library, Harvard University. Detail showing that the fine white lines between shallows and relief lines were caused by the inking dabber accidentally depositing ink in the shallows and the paper not picking up the ink from the escarpments between relief plateaus and etched valleys. 15b. (bottom) William Blake, Europe a Prophecy, plate 1. Relief etching, 23.4 × 16.7 cm., etched 1794, printed c. 1794. Yale Center for British Art, Paul Mellon Collection. Detail of the same section of the plate as illustration 15a, but the shallows of this impression were not accidentally blemished with ink and hence the white line escarpments defined by the blemished and relief areas are absent. 16. William Blake, The First Book of Urizen copy D, plate 1. Relief etching, 14.9 × 10.3 cm., etched 1794, color printed and finished in watercolors and pen and ink 1794. British Museum. Detail showing printed colors painted over inked relief lines of tree branches, with colors spilling over on both sides of the relief lines. 17a. William Blake, The First Book of Urizen copy C, plate 24. Relief etching, 15.0 × 10.4 cm., etched 1794, color printed and finished in watercolors and pen and ink 1794. Yale Center for British Art, Paul Mellon Collection. Detail of right side of the plate showing traces of color spilling over from relief areas into margin. 17b. William Blake, The First Book of Urizen copy F, plate 24. Relief etching, 15.0 × 10.4 cm., etched 1794, color printed and finished in watercolors and pen and ink 1794. Typ 6500 42F, Department of Printing and Graphic Arts, Houghton Library, Harvard University. 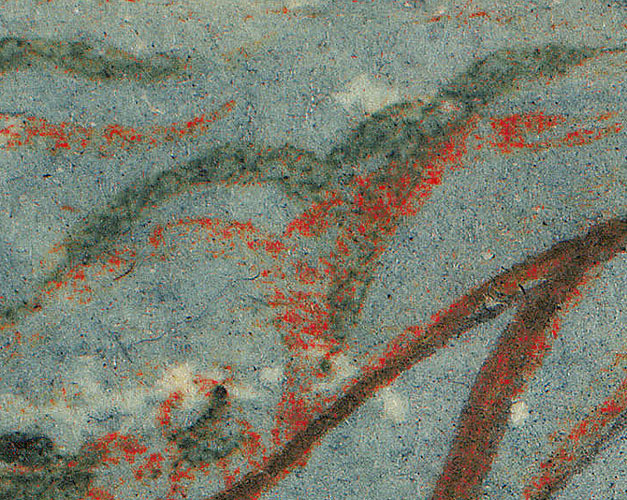 Detail of left side of the plate showing traces of color spilling over from relief areas into margin. of the white-line escarpments of the second pull impossible—and detection under magnification or computer enhancement possible. 18. William Blake, America a Prophecy copy H, plate 10. Relief etching, 23.5 × 16.7 cm., etched 1793, printed 1793. British Museum. 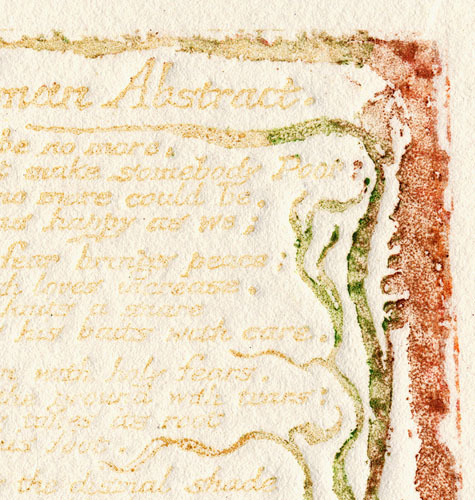 Detail of bottom right corner, showing droplets of ink spilling over into margin (similar to that seen in some color prints) and white space between shallows and relief areas. The fine white line at the bottom is the sharp edge of the plate and the ink below the line is from the side of the plate, which was picked up either because the paper was especially damp and supple or the printing pressure was substantial enough to force the paper around the side of the plate. the press. Color printing, particularly when done from the shallows as well as the relief areas, multiplies the chances for accidental deposits of ink and colors that do not contribute to the printed image, calligraphic or pictorial. Thus it should be no surprise that Blake’s color prints show, on average, more accidental effects than monochrome impressions. 19. William Blake, The Song of Los copy E, plate 1. Relief etching, 23.4 × 17.3 cm., etched 1795, color printed and finished in watercolors 1795. Huntington Library. Detail of opaque colors that appear color printed but were applied to the impression over the printed colors. copy T1. Because he can see with infrared light the etched date “1794” lying under an opaque color, Phillips claims that Blake first printed the date in ink and then the colors covering it (103). But Phillips does not argue (much less prove) that the opaque colors were printed from the plate, nor does he consider the possibility that these colors were painted on the impression, as they often were. For example, the black opaque colors in America copy A and Europe copy A were applied to the impressions and are not printed from the plate. In Songs of Innocence and of Experience copy E, “Infant Sorrow,” the Experience title page and frontispiece, “A Dream,” and “The Garden of Love” have a black color that is easily confused with true color printing. The Book of Urizen copy B is described by Bentley as being color printed (Books 170), but it is not; black, gray, green, and red opaque colors were applied over the black ink, possibly while it was still tacky, to produce a reticulated effect. 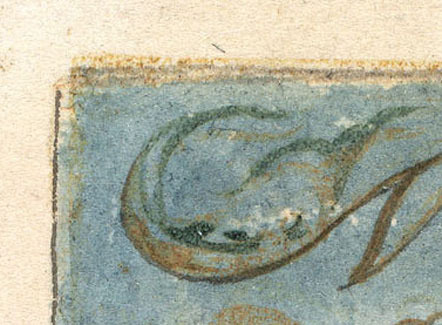 A detail of the paint layer on plate 1 of The Song of Los copy E (illus. 19) demonstrates that Blake used his thick, opaque paints to finish color prints by hand, directly on the impressions, as well as to color print from the copperplates. The gray opaque paint in “The Fly” of Songs of Innocence and of Experience copy F (illus. 25), which was printed in the same session as Songs of Innocence and of Experience copy T1, demonstrates the same. Colors applied to the impression by brush are smoother and usually thinner than colors printed from the plate, which are spongy or reticulated. The difference is easily seen in the title plate of The Book of Urizen copy D, where the reticulated bluish-gray color printed from the shallows of the tablets and knees is outlined on the impression in a darker hue of the same color. Note also that colors printed over ink do not fully hide but mix with the ink; that is, traces of the ink remain visible in the reticulations of the colors, because colors and ink were both printed wet. The same effect is created when color and ink are printed sequentially or if color is applied to wet or tacky ink. In fact, by adding opaque colors to the impressions while the ink was still tacky, the facsimilists of the Manchester Etching Workshop were able to create the look and feel of printed colors, as is demonstrated by their facsimile of “Infant Sorrow” (Viscomi, “Recreating” 11). Colors brushed over dry ink appear smoother. Phillips is right about the color over the date indicating a second stage in the production of the impression, but that second stage did not involve printing the color in a second pull. Had Blake done that, the wet colors would have mixed with the wet ink. Rather, the color was applied over the date when the impression was being finished in watercolors and pen and ink. These overlying colors have much smoother textures than the reticulated surfaces of printed colors. Further, if the colors had been printed over the date when the inked numbers were still wet, they would have mixed with the colors and become streaked or fuzzy, or even dissolved completely into the overlying colors. But, as Phillips’ ultraviolet photograph of the impression (his color plate 50) reveals, the underlying numbers are clear and crisp. The colors must have been applied over the date when the ink was dry—and the ink would not have been dry if the overlying colors had been printed immediately after the first pull as part of a two-pull printing process. 20. 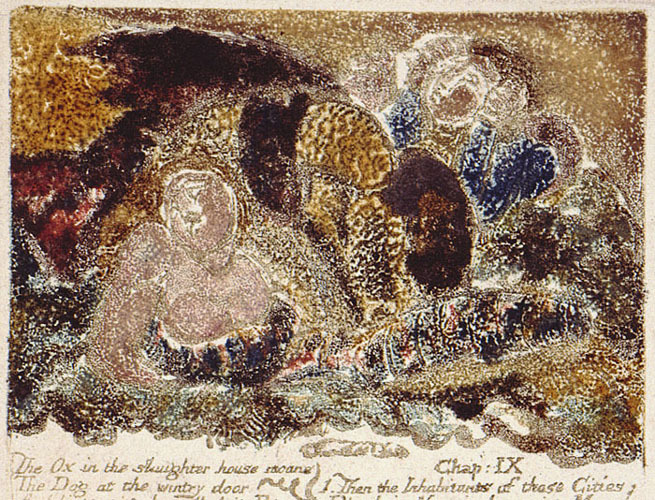 William Blake, Experience title plates of Songs of Innocence and of Experience copies F (top) and T1 (bottom). Yale Center for British Art, Paul Mellon Collection (copy F) and National Gallery of Canada, Ottawa (copy T1). Details of pillars and figures in the two impressions, showing that they share the same pattern of printed colors around the date. This shared pattern indicates that the two impressions were printed in the same session. The white escarpments, visible in the copy F impression, were painted over in the copy T1 impression in the same gray color used to paint out the date. 21. William Blake, Experience title plate of Songs of Innocence and of Experience copy G. Detail of pillars and figures, showing the same pattern of printed colors as the impressions in copies F and T1 (illus. 20). Collection of Maurice Sendak. when the impression was finished in colors and watercolors. 22. William Blake, title plate, Songs of Experience. Relief etching, 12.4 × 7.2 cm., etched 1794, color printed and finished in watercolors 1794. Songs of Innocence and of Experience copy T1, 1794. National Gallery of Canada, Ottawa. Detail of pillars and figures, computer enhanced by changing the contrast and midtones to reveal the escarpments and other unprinted areas before they were painted over. This pattern of color printing matches what we see in the Songs of Innocence and of Experience copy F (illus. 20) and copy G (illus. 21) impressions, both printed in the same session with this copy T1 impression. just outside of the plate image (plates 49 & 66 [his reproductions of title plate and “London”]).” According to Phillips, “this reveals that Blake used the traditional method of registration for printing a single sheet from more than one plate, but that he adapted the technique so that he could print twice from the same plate” (98). This claim, and the hypothesis that it indicates two-pull printing, is based on the use of pinholes in multiple-plate color printing, in which the same-size plates were given pinholes, drilled into the copperplates, in the same positions in each plate. Printing from the first plate indents the holes into the paper; the printer pricks the holes with pins and aligns the paper to these holes when printing from the other plates. (Alternatively, the printer may use such a sheet of paper as a key to prepare a stack of damp paper with corresponding holes just before printing.) Registering paper to plates using this method requires at least two pinholes (Hayter 57), usually top and bottom, though four, one in each corner, appears to have been the norm in the eighteenth century. Because the sheet of paper blocks sight of the plate, this type of registration is done by touch, i.e., a pin through the paper engages the corresponding hole in the plate; the other pins feel for their holes, and when the paper is in position, the paper can be dropped into place (Hayter 58). The holes Phillips claims he found were one per plate, each near the top left corner of the plate. 23. 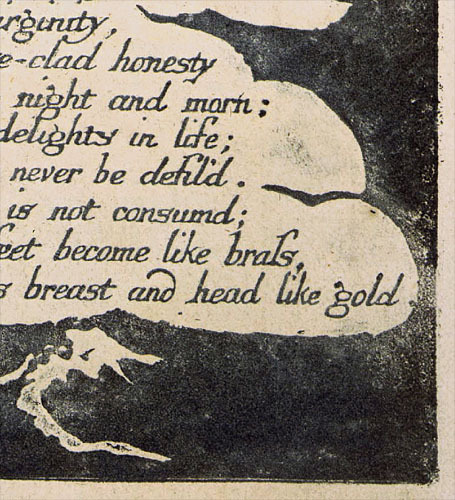 William Blake, title plate, Songs of Experience. Relief etching, 12.4 × 7.2 cm., etched 1794, color printed and finished in watercolors 1794. Songs of Innocence and of Experience copy T1, 1794. National Gallery of Canada, Ottawa. Detail of top left corner of sheet showing two specks in the paper and one of three stab holes for the binding, but no pinhole. have been misinterpreted as a pinhole. There are a few other similar specks in the left margin of the sheet and stab holes for binding the leaves (illus. 23). Thus, the only holes in the sheet were made as part of the binding procedure and have nothing to do with printing the plate. These findings were corroborated by our digital scan of the corner of a 4 × 5 inch color transparency of the image at 3500 dots per inch. Geoffrey Morrow, Senior Conservator of Prints, Drawings, and Photographs at the National Gallery of Canada, confirms our findings and has informed us that none of the four plates discussed by Phillips has a pinhole (private written communication, 13 Aug. 2001). Rather, Morrow finds in the top left corner of these four plates, and in all but one print from Songs of Innocence and of Experience in the Ottawa collection (for a total of ten plates), a small ink dot in the top left corner of the plate. The one exception is “The Poison Tree,” which has an ink dot at the top left corner of the framing lines rather than the top left corner of the plate. Six of these marked plates, plus “The Poison Tree,” are from copy T2, which is not color printed. Thus, the ink dots could not be related specifically to color printing processes. There is no physical evidence that Blake ever experimented with the pinhole method of registration. If the marks at the top left corners of the Ottawa plates were made purposefully (as seems likely, given their presence on so many plates), they could not have had anything to do with registration since they could not have been visible when the paper was placed, face down, onto the copperplates. These marks were very probably made by someone other than Blake after the impressions left his hands. Indeed, they were probably made after the Ottawa plates were detached, as a separate and autonomous group (Bentley, Books 421) from the other T1 and T2 impressions, none of which shows any of the ink dots at issue. If Phillips could not revisit Ottawa to confirm the presence of pinholes, then, as co-curator of the Tate Britain exhibition, he was surely in a position to study at least the title page to Songs of Experience on loan from Ottawa and comment on the absence of a pinhole in his “Corrigenda” published in Blake/An Illustrated Quarterly 35 (2001): 30-31. Perhaps he worked from photographs and misinterpreted various flaws in the paper or ink droplets, more or less at the top left corners of the prints, as pinholes. Morrow tells us that, in his correspondence with Phillips, he discussed pinhole registration (see our note 17), but that he never told Phillips that there were actual, observable pinholes in any of the Ottawa prints. Theoretical superstructures rarely collapse even when their material bases evaporate. It is certainly possible that someone somewhere someday will find an impression of one of Blake’s illuminated books with a tiny hole in the paper. We wish to dissuade researchers of a future age from leaping to the conclusion that such a hole has something to do with registering plate to paper during printing. The reasons for rejecting even the possibility that Blake used single-pinhole registration extend well beyond the mere absence of physical evidence of actual holes. Phillips does not explain why his supposed pinholes are outside the edge of the plate (the “traditional method” called for the holes to be in the metal itself), and suggests that Blake used a single pin as an axis to “somehow”17↤ 17. Phillips 99, quoting Geoffrey Morrow of the National Gallery of Canada. swing the paper off the plate, which was then removed, wiped of its ink, applied with colors, returned to the bed of the press in exactly the same position, and then the paper was swung (presumably being held off the bed of the press by Mrs. Blake so it would not offset) back exactly into place for the second printing. This seems highly unlikely—or very likely to create a misalignment. One pinhole is only marginally more effective than none at all and requires a second marker, such as a guide line on a bottom sheet (see below), to bring the plate back to its initial position; less than two per plate serves no purpose for keeping the paper in a fixed position. Besides the lack of practical utility if only one pin is used, it is difficult to explain a circumstance in which only a single impression, produced in a print run that included multiple impressions from each plate, shows a pinhole. Blake printed x number of impressions from one plate before moving to another plate in the same work. If pinholes were made for the purpose of printing the plate twice upon the paper, then the other impressions pulled from each plate in the same press run would also have pinholes. Otherwise, we would be forced to assume that Blake printed one impression with begin page 90 | ↑ back to top a pinhole, the others without, then moved to a second plate using the pinhole method of registration for one impression, but not for the others, and so on, moving back and forth between using and not using pinholes. This would be an exceedingly inefficient printing method. The assumption that any pinholes were made by Blake, let alone for registration, stands on very shaky ground. Future discoverers of tiny holes in Blake’s relief-etched prints, color printed or not, must consider such holes in the context of the press-run in which the impressions were created and in light of their subsequent histories of ownership, sale, and rebinding.18↤ 18. Phillips interprets the small holes he claims exist in the four Ottawa impressions not only as registration pinholes but also as evidence that Blake began his color printing experiments with these four plates (98). The evidence for the Experience plates in Songs of Innocence and of Experience copies F, G, H, and T1 having been printed together and before copies B-E is presented in Viscomi, Idea 267-73. Viscomi also suggests that these four copies are not incomplete, despite having only 15-17 plates, but were printed as works in progress. They may have been Blake’s first color-printed illuminated books. His new technique of color printing may have motivated him to print his most recent illuminated book before it was completed. Phillips believes the supposed pinholes that he identifies as registration guides mark exactly where Blake began developing the technique (98). The Marriage of Heaven and Hell copies E and F, however, which are as accomplished as the Experience color prints, were color printed in the same style and on the same Edmeads & Pine paper used in early copies of Songs of Innocence, and they could have preceded Songs of Innocence and of Experience copies F-H and T1, which were printed on paper without watermarks, as could have copies A-D, G, and M of There is No Natural Religion, which were rudimentarily color printed, also on paper without watermarks. With Songs of Experience, Blake seems to have seized the moment for all of its graphic possibilities: to practice color printing, to proof new plates, and to gather from the resulting impressions a few sets of prints. Had developing the technique been Blake’s sole intention at the time, then he would probably not have used seventeen plates, let alone systematically printed four impressions per plate, nor would he have formed copies out of the resulting impressions. Given the evidence now at hand, we do not know for sure which plates Blake color printed first, or even if the first experiments in color printing are extant. Phillips also discusses (106) Blake’s use of lead white in early color-printed copies of Songs of Innocence and of Experience, and implies that the lead white was printed from the plates. The lead white we have found in copies of Songs of Innocence and of Experience was applied by hand to the individual impressions. Phillips, in his discussion of the supposed pinholes in the Ottawa prints, acknowledges the fact that there are no pinholes in any other color-printed impressions. This absence inevitably forces him to conclude that Blake abandoned the procedure, quickly moving on to find different ways to register the plates.19↤ 19. Phillips also speculates that pinholes may have been present in other impressions but repaired (101). In all the eighteenth-century color prints using pinhole registration that we have seen, the holes, even when repaired, are not difficult to see as slight, rounded marks in the paper. Many of the original color prints, particularly the later French chalk engravings meant to imitate pastel drawings, were trimmed to within the platemark and pinholes, thereby eliminating evidence of printing and enabling the print to pass as a drawing. Phillips suggests that Blake could have registered them by using a bottom sheet, or by using the roller to grip and hold the paper in place, or by using weights to hold the paper in place and mark the plate’s position (101, 107). All three methods are used today by fine-art printmakers printing multiple plates; but only one method, the bottom sheet, is known to have been used by late eighteenth-century printmakers.20↤ 20. Faithorne mentions a bottom sheet “to compass and make the Margin of the Plate” (58), but says nothing further about registration. Anon., Sculptura, offers nothing on printing. Dossie describes a bottom sheet, “the size of those that are to be printed,” used to “mark out the place where the plate should lie, that he [the printer] may the more readily put it, each time an impression is to be taken from it, in its proper situation” (2: 193-94). By explaining the ways modern printmakers register multiple plates, Phillips again implies that Blake was more innovative than we have realized. References to modern practices also make it seem less improbable that Blake used two-pull printing. Had Blake used any of these methods, however, he still would not have been able to conceal two-pull printing so completely. A printer can place on the bed of the press a sheet of paper cut to exactly the same size as the sheet to be printed. Marks or lines are then drawn on this “bottom sheet,” as it is generally called, as guides to the placement (and later replacement) of the plate on the bottom sheet. The sheet to be printed is then registered to the four sides of the bottom sheet, thereby replicating the registration of plate to bottom sheet. This procedure is repeated before each pull through the press; registration is assured as long as the plate is placed in its proper position on the bottom sheet and all sheets to be printed are the same size as the bottom sheet. The use of a bottom sheet is indicated by correct registration, with evenly aligned margins between the edges of the printed image and the edges of the paper. In the case of series work—that is, printing a set of impressions from the same plate (and all printing is to some degree series printing)—bottom-sheet registration is indicated by the same sheet size and the same margins among all members of the set. This is what we see in the facsimiles of sixteen plates from Songs of Innocence and of Experience copy B printed by the Manchester Etching Workshop in 1983. Seventy-five impressions were pulled from each plate (35 monochrome and 40 hand colored in imitation of copy B). Using bottom sheets under a sheet of Plexiglas designed to center plates to paper ensured uniform margins among all impressions from the same plate. For aesthetic reasons, the sheets, at 21 × 17 cm., were larger than Blake’s, approximately 18.5 × 12.5 cm., to create margins of 5 mm. or more between the images and edges of the sheets. 24. 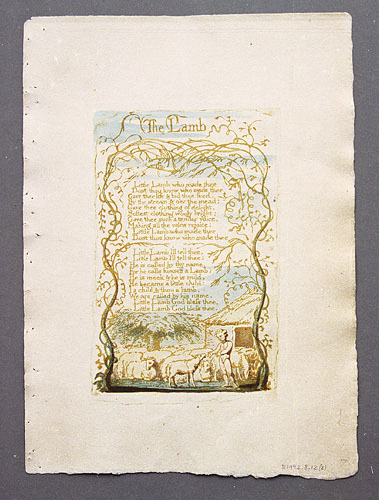 William Blake, “The Lamb.” Relief etching, 11.9 × 7.7 cm., etched 1789, printed and finished in watercolors 1789. Songs of Innocence copy G, 1789. Yale Center for British Art, Paul Mellon Collection. The image is too low on the page. though it were falling, and images slanted relative to the edges of the paper, so that the plate tilts to the left or right. For example, the top margin of “The Lamb” in Songs of Innocence copy G (illus. 24) is 3.9 cm. while the bottom margin is only 2.8 cm., creating an image that falls very noticeably. “The Shepherd” from the same copy is off center, slants to the left, and, with a top margin of 4.5 cm. and a bottom of only 3.5 cm., falls on the page. “The Little Boy Lost” from the same copy tilts towards the spine. Further, the margins of the various impressions pulled from the same plate in the same printing session all differ. All these characteristics violate the bibliographic and print-publishing conventions of Blake’s time; slanted images stray from any standard of alignment and symmetry. In general, the registration of plate to paper in the illuminated books is quite poor, possibly one of the features that prompted William Muir to refer to Blake’s printing as “skillful carelessness.”21↤ 21. Letter to Bernard Quaritch, 31 March 1922 (quoted in Viscomi, Idea 102). Songs of Innocence and of Experience copy E has many poorly registered images. The “Introduction” in Experience has a 3.0 cm. top margin but only a 2.3 cm. bottom margin, making the image appear to be falling down the sheet; “Laughing Song” has a top margin that is 3 mm. wider than the bottom and the image slants to the right. “Nurses Song” has a top margin 4 mm. wider than the bottom. Though less pronounced, the same “skillful carelessness” is apparent in Songs of Innocence and of Experience copies B, C, and D. From the perspective of a book designer, these early copies with color-printed impressions are not visually coherent: an Innocence poem is in Experience, the ink color differs in the two sections, Experience has plates in different lettering styles and ink colors (e.g., plates 34-36). This kind of disregard for precision and uniformity appears throughout Blake’s graphic works. For example, even the relettering in pen and ink on the additional impression of plate 2 in The Book of Urizen copy C is not registered to the printed words. The engraved lettering in Chaucers Canterbury Pilgrims, the Job engravings, and the “Laocoön” separate plate also shows a lack of precision in the placement of the letters relative to each other and relative to the preliminary lettering scratched into the plates. 25. William Blake, “The Fly.” Relief etching, 11.8 × 7.3 cm., etched 1794, color printed and finished in watercolors 1794. Songs of Innocence and of Experience copy F, 1789/1794. Yale Center for British Art, Paul Mellon Collection. With the mat lifted, the image can be seen to be too low on the page. 26. William Blake, “The Little Girl Lost.” Relief etching, 11.2 × 6.6 cm., etched 1789, printed and finished in watercolors 1789. Songs of Innocence and of Experience copy F, 1789/1794. Yale Center for British Art, Paul Mellon Collection. Under the mat, the image can be seen to be too low on the page and to slant to the left. image and not the artifact that is being reproduced. 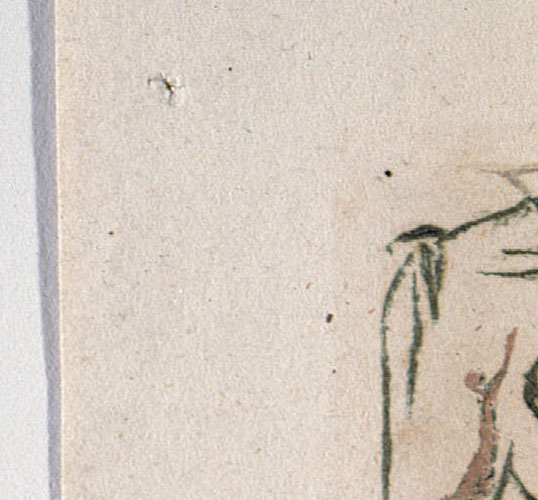 Even first-rate facsimiles, like those by the Blake Trust and Manchester Etching Workshop, align the images on the paper. Examining the originals themselves may not reveal much bibliographical information because many have been disbound and mounted in mats. For example, “The Fly” from Songs of Innocence and of Experience copy F (illus. 25) is professionally matted to appear perfectly aligned, but lift the mat and you can see that the image is too low on the sheet. “The Little Girl Lost” (illus. 26) in the same copy is even more dramatically rescued by its mat; seen in its original condition, though, the image falls and slants to the left. Nor did the Blakes pay any more attention to the alignment of facing pages, such as frontispiece and title plate. In Songs of Innocence and of Experience copy F, neither those facing pages in Innocence (illus. 27) nor those in Experience are aligned, but for exhibition purposes they are matted to appear so. 27. 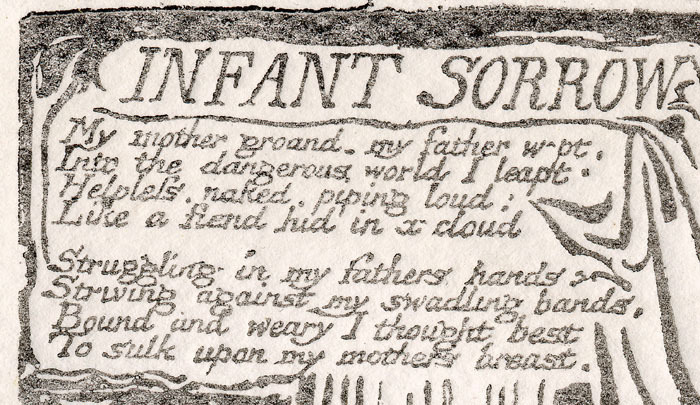 William Blake, frontispiece and title plate, Songs of Innocence. Relief etchings, 11.0 × 7.0 cm. 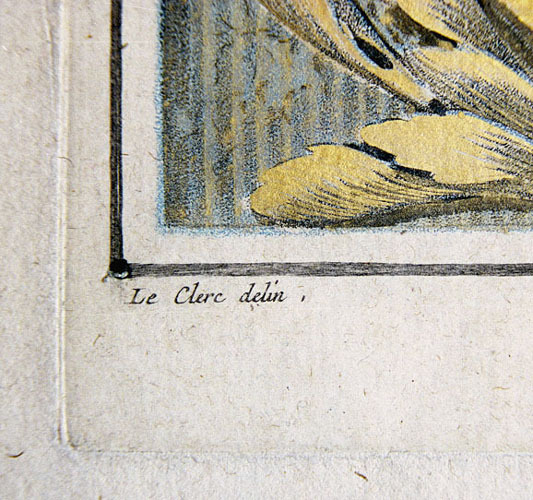 and 12.0 × 7.4 cm., etched 1789, finished in watercolors 1789. Songs of Innocence and of Experience copy F, 1789/1794. Yale Center for British Art, Paul Mellon Collection. Under the mat, the sheets are adjusted to make the poorly registered images appear aligned. 28. 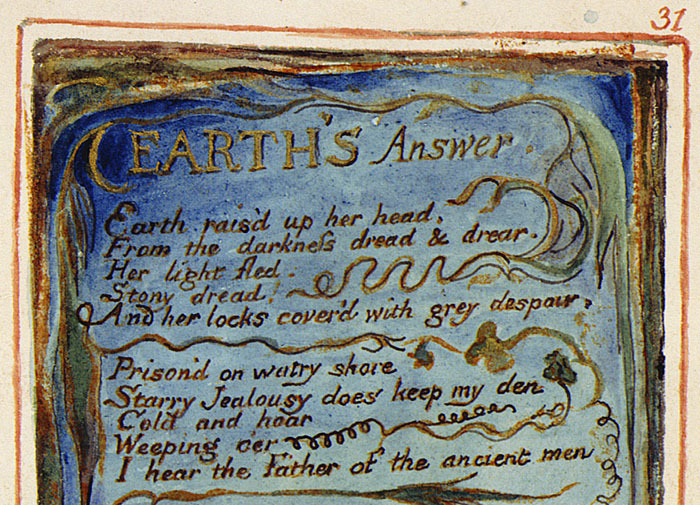 William Blake, “Earth’s Answer. Relief etching, 11.7 × 7.2 cm., etched 1794, printed and finished in watercolors and pen and ink c. 1825. Songs of Innocence and of Experience copy Z, c. 1825. Library of Congress. Detail, showing misalignment of plate to paper and pen and ink over text. The text slants dramatically to the left, but the edges of the plate look more evenly aligned to the sheet because Blake has painted new edges on the impression to disguise the printed ones, as can be seen most clearly along the upper right margin and the top margin on the left. also provides another kind of evidence that Blake did not use bottom sheets and was not concerned about following guidelines. Blake drew four lines in pen and ink around each plate to create a frame consisting of three bands of different widths. He drew the pen lines over pencil lines but rarely traced them exactly or erased them when visible, nor did he stay within the lines when applying his wash. Indeed, no frame in Songs of Innocence and of Experience copy V is precisely rendered: pencil marks were not adhered to, multiple pen lines form one framing line, corners are missing because lines did not meet, colors spill over lines, and the bands are not symmetrical (by as much as a 3 mm. difference) in width on all sides. The frames are not uniform in size, nor do they try to compensate for the poor registration of the plates, or try to create uniform margins among the pages. In short, the pencil guidelines, which are analogous to those on a bottom sheet, were either poorly followed or ignored altogether. Blake’s talent for following precisely his own guiding lines was never highly developed. 29. Title plate, Songs of Innocence. Line block cast from electrotype, 12.0 × 7.4 cm., printed with bottom sheet to register plate to paper. Manchester Etching Workshop, 1983. Detail, showing bold guide lines and traces of ink along side of plate from previous position of the plate on the bottom sheet. difficult; even with careful registration, the uneven sides of the plates cannot be aligned with the edges of a rectangular sheet on all four sides. Nor can the plates be perfectly aligned to straight guidelines let alone to a shared bottom sheet. For instance, if all the different size plates were aligned to the same guidelines, then all the pages in the book would share at least one (top or bottom) identical margin at the expense of the other margins being overtly of different dimensions, but that is certainly not what we see in the illuminated books. Instead of fitting a series of plates to a uniform bottom sheet, Blake would have had to fit sheets per plate—that is, prepare custom-made bottom sheets. Such sheets would have been crucial in two-pull printing, because that actually involves four registrations (see below), which requires very precise guidelines and strict adherence to them. Given all of these easily observed characteristics of the illuminated books, Phillips’ proposals about bottom-sheet registration ask us to believe that Blake had difficulty with a kind of registration that did not require exact alignment, the purpose being to position properly the plate on its sheet of paper, but could execute the enormously more difficult registration required of two-pull printing over 650 times with only one mistake. A closer look at the use of bottom sheets is in order. The plate in illustration 29 lies on a sheet of Plexiglas under which lies a bottom sheet with bold guidelines. The alignment of the plate differs from its previous position, which is signified by the traces of ink on the Plexiglas along the edge of the plate. Placing the plate on or near the proper lines for a single pull is easy enough, and there is no penalty if the alignments are only approximate or if they differ slightly among impressions. But this method of registration is exceedingly complicated for two-pull printing and, when not precisely executed, has serious aesthetic consequences. It is easier to register paper to plate with pinholes because that is a one-step registration, no matter how many plates are used or where they are placed on the bed of the press. You always register the paper to the plate, not to the bed of the press, because the pinholes are in the metal plate itself.23↤ 23. Le Blon did not use a bottom sheet to print, though The New Encyclopedia Britannica article on “printing” mentions “a hand drawn grid” (vol. 14, column 1051). Lilien, however, states that “this can only be described as a misleading and regrettable term to describe the roughening of the copper surface required for starting work on a mezzotint plate” (83). The holes were drilled into the plate before printing, so that the printer needed only to align the sheet to the plate with the four pinholes. A bottom sheet for two pulls, however, requires preparation time and four registrations as an essential part of the printing process. After the printer and the assistant mark the bottom sheet with guidelines, they must register the plate exactly to the markings; second, they must register the paper to at least two edges of the bottom sheet; third, after they remove the paper and plate from the press, they must return the plate for its second printing and again register it exactly to the markings on the bottom sheet; fourth, they must again register the paper exactly to the same edges of the bottom sheet. If during any one of these registrations the printer is off by as little as a hairline in any direction (e.g., directly on a guide line rather than next to it), the impression will be slightly out of focus or at the very least reveal the hairline discrepancy under magnification (illus. 5a-b, 6, 7a). It seems highly improbable that there would be no other poorly registered impressions in color-printed illuminated books, other than the print of “Nurses Song” previously discussed. As noted, Phillips’ theory asks us to believe that Blake was amazingly skilled in registering each plate twice, to yield over 650 perfectly aligned impressions, something Le Blon, Jackson, and other commercial printers set up for multiple-plate work could not do—and to reconcile this with the clearly observable fact that Blake was carelessly inexact in the registration of plate to paper. The two-pull hypothesis generates these kinds of inherent contradictions when considered in light of Blake’s characteristic practices as printer and artist, and, as we will see, when seen in the light of Blake’s theories of art. Because the plates of an illuminated book are not uniform in size, and because the sheets of paper they are printed on are not exactly the same size, Blake could not have used the same bottom registration sheet for all plates in the same book. Could Blake have used a different, custom-made bottom sheet for each plate, or sheets with guidelines to accommodate various sizes of plates? No, for the reasons given above: their presence would be revealed in better alignment of plate to paper than we find in Blake’s work, and this more exacting alignment would be replicated in all other impressions pulled from the plate in the same press run. Even if we abandon the idea that Blake printed multiple impressions from each plate and assume for the sake of argument that he printed only one impression before moving on to begin page 95 | ↑ back to top another plate, we would still expect sheets that were aligned to bottom sheets to have images registered more precisely to the printed sheet than we can observe throughout the illuminated books. We would also have to explain the waste of a great deal of paper to create many bottom sheets. And we would be forced to embrace the now-discredited theory that Blake produced his books per-copy rather than per-plate, one at a time rather than in small groups, and embrace also all the economic and practical inefficiencies that entails. While in principle registering paper and plate to a bottom sheet appears to work well for the production of one impression, the procedure becomes hopelessly complicated in practice when any one plate is printed more than once, when it is part of a series, and when numerous impressions are pulled from it. The technique breaks down by its own clumsiness and inefficiencies that produce no aesthetic gain.24↤ 24. Similarly, the notion that Blake transferred his designs and texts from paper to copperplate, to avoid having to draw and rewrite his text backwards directly on the plate, creates a clumsy and unnecessary inefficiency for someone like Blake, skilled at designing and writing backwards. See Essick, Printmaker 89-92, and Viscomi, Idea 16-25, 28-29, 370. If ignoring the evidence that Blake printed per-plate rather than per-book is not reasonable, then is it reasonable to suggest that Blake used a bottom sheet exclusively for color printing? Putting aside the thorny issue of Blake abandoning his direct mode of printing for a highly mechanical one for two or three years, the answer is still no. The same features noted above—impressions poorly registered to sheet edges and no shared margins within a book or among impressions from the same plate/bottom sheet—are true of color prints. The presence of diverse margins among pages in the same book, as well as in impressions from the same plate in the same printing session, reveals that Blake did not waste paper for bottom sheets but instead “eyeballed” the paper to the plate, which is still a common practice today.25↤ 25. For more detailed information on bottom sheets in printing and why we can be sure they were not used by the Blakes, see Viscomi, Idea 105-07, 394nn5, 6, 8. Given what we have seen of William and Catherine Blake’s skill at registering paper to plate and their apparent disregard for mechanical precision, it is hard to believe either of them would have put the effort into, or succeeded every single time but one at, these numerous registrations. For impressions printed recto/verso, such as those in Songs of Innocence and of Experience copy E, the paper would have been registered eight times and passed through the press four times. It is difficult to envision a more complex and inefficient method for producing color prints. Phillips speculates that Blake could have used the roller of the press to pin the sheet of paper down, holding it in place, while the plate was removed, worked on, and returned to its place, which could have been indicated either on a bottom sheet or by two metal weights forming a corner where the plate was placed. According to Hayter, who used this method in his Atelier 17, the “position of the plate was marked with great precision on the bed of the press” and a “longer than usual . . . sheet of paper” was required. Nevertheless, like other registration methods, this one was not absolutely precise, because “after only one pass through the press, the paper has become stretched in length, and even when dry will never return exactly to the length it once had; then again, owing to the slight displacement of the blankets as the roller passes over the thickness of the plate, the register cannot in theory be guaranteed to less than one-half of this thickness” (58). Blake would have encountered other problems with this method. The circumference of the upper wooden roller of the eighteenth-century press that was displayed at the Blake exhibition at Tate Britain as an example of the kind he most likely used is 71.4 cm.26↤ 26. We are grateful to Keith Parker, assistant curator at The National Museum of Science & Industry, London, where the press is located, for measuring the circumference of the top roller. On such a press, at least 11 cm. of paper is beneath the blankets and the curvature of the roller when the margin of the sheet is held in place by the roller. At least 5 cm. of the paper is completely covered by the roller and blankets. To use this method of registration, Blake would have had to use sheets at least 22.5 cm. long and place the plate under the curvature of the roller. Slipping the plate in and out of such a tight fit cannot be done without the paper touching the top edge of the plate as you return it to its place. But Blake’s sheets for the color-printed copies of Songs of Innocence and of Experience were approximately 18.5 × 12.5 cm., which means Blake could not have used this method because there would not have been enough paper for the roller to grip. Plates like the Experience title plate, at 12.4 × 7.2 cm., provided top and bottom margins of only 3 cm. Nor could he have used this method for There is No Natural Religion, copies of which were rudimentarily color printed in two colors on paper approximately 14 × 11 cm. As Hayter notes, the method required “a sheet of paper rather longer than usual” (58). Given the small sizes of Blake’s paper, gripping the sheet in place with the roller is the least likely way that Blake could have proceeded. Even with a somewhat smaller roller, as in modern presses (which range between 63 and 68 cm. ), the hold-under-the-roller method still wouldn’t work for printing on the paper sizes Blake used. Holding the sheet in place with a metal weight and indicating the plate’s position by two weights forming a corner is equally inexact, particularly for small sheets of paper and small plates. This technique is more suitable for large plates, the size of America or larger, where a 1 mm. misregistration is less noticeable since it is a smaller percentage of the whole. With a small plate, even a slight misregistration is noticeable. 30. 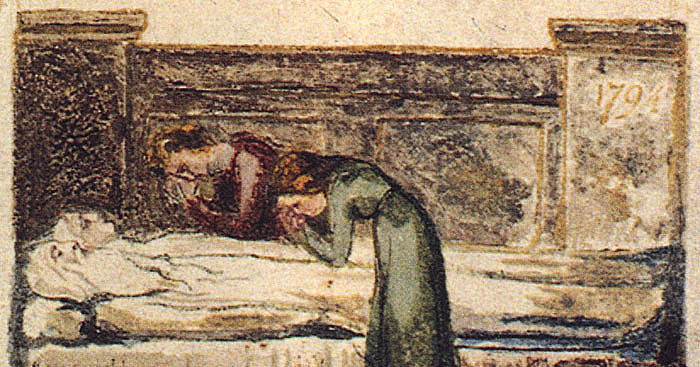 William Blake, “Holy Thursday” (Experience). Relief etching, 11.3 × 7.3 cm., etched 1794, color printed and finished in watercolors 1794. Songs of Innocence and of Experience copy E, 1789/1794, with additional washes c. 1806. Huntington Library. Detail of text that printed well in yellow ochre ink. We can now return to the single most important piece of evidence cited by Phillips, the “Nurses Song” (illus. 2) in the Experience section of Songs of Innocence and of Experience copy E, where we are again confronted with the questions of efficiency and waste. As we have seen, Blake was quite conscientious about not wasting materials, foregoing bottom sheets, cutting his own copper plates from larger sheets of copper, relief etching both sides of most plates, using yellow ochre, green, and raw sienna pigments mostly in the early years, which were the least expensive pigments in London at the time (Viscomi, Idea 392-93n4), and trying to get more than one impression from one inking. 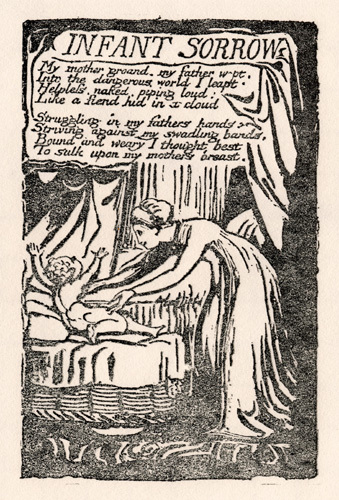 In fact, the lengths to which Blake would go to avoid wasting materials can be seen in “Nurses Song” and many of the other impressions in Songs of Innocence and of Experience copy E.
31. William Blake, “The Tyger.” Relief etching, 11.0 × 6.3 cm., etched 1794, color printed and finished in watercolors 1794. Songs of Innocence and of Experience copy E, 1789/1794, with additional washes c. 1806. Huntington Library. 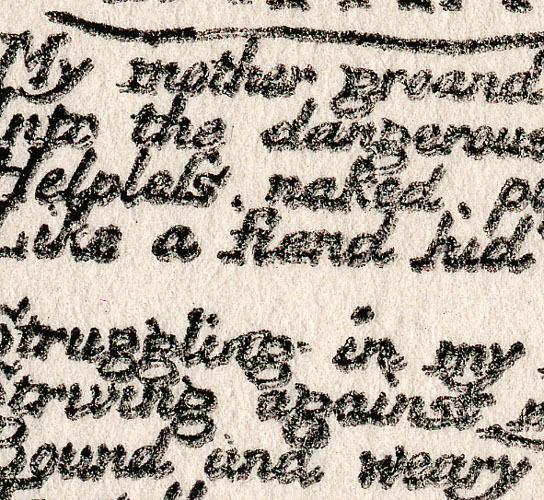 Detail of text very poorly printed and gone over completely in pen and ink. Note the displacement between the lightly printed “C” of “Could” (last line of text pictured) and the over-writing in pen and ink. rejected impressions. 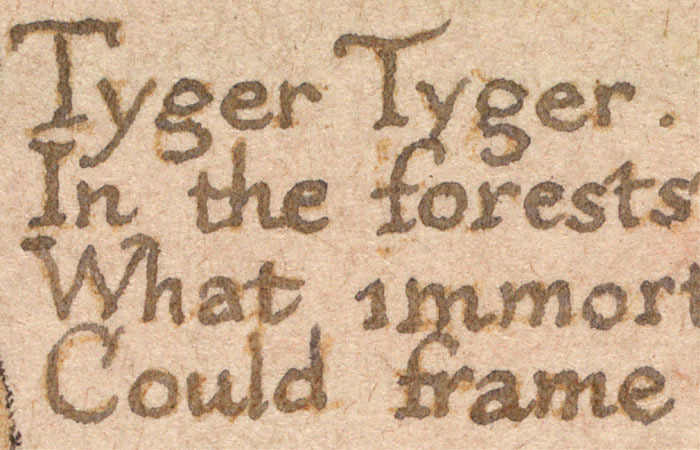 Most of the texts, such as “The Tyger,” required extensive rewriting with pen and ink because they were so lightly printed, the result of being the second—or possibly even the third—pull without re-inking (illus. 31). They are poor, in other words, precisely because Blake tried to get too many impressions from one inking in a thin, lightly colored ink. Indeed, if he had re-inked the plate each time after the plate had been completely wiped of ink, as Phillips’ two-pull theory requires, then the impressions would not have been this poor. They would all have been as dark as “Holy Thursday” (Experience), which required no reworking (illus. 30). In effect, Blake salvaged a set of mostly poorly printed impressions through considerable handwork and recoloring and transformed it into one of his most intriguing and technically complex copies of Songs of Innocence and of Experience. Though initially reluctant to include the poor impressions in the copies of the Songs of Innocence and of Experience he compiled and sold in the 1790s, Blake did not throw them out. He even kept “Nurses Song,” despite the seriously flawed double printing. The very fact that he kept “Nurses Song” strongly implies that he would have kept less poorly registered impressions as well, which argues against the notion that there are no other poorly registered color prints extant because Blake’s technical standards were so high that he threw them away. Rather, there are no poorly registered color prints other than “Nurses Song” because only “Nurses Song” was printed twice, and, as we will see, only in “Nurses Song” did Blake attempt a shortcut for repairing a poor impression: reprinting the text rather than rewriting it by hand on the impression. 32a. William Blake, “Nurses Song” (Experience). Relief etching, 11.1 × 6.9 cm., etched 1794, color printed and finished in watercolors and pen and ink 1794. Songs of Innocence and of Experience copy E, 1789/1794, with additional washes c. 1806. Huntington Library. 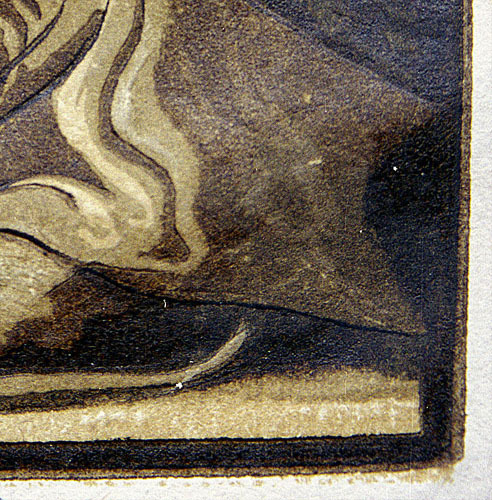 Detail of top left corner, showing flecks of yellow ochre ink on top of green color, proving that the yellow ochre was printed second. In this monochrome reproduction, the yellow ochre is the lighter of the two colors forming the branching tendril (or, rather, two tendrils because of the double printing) rising from the first diagonal of the letter “N” in the title inscription. 32b. William Blake, “Nurses Song” (Experience). 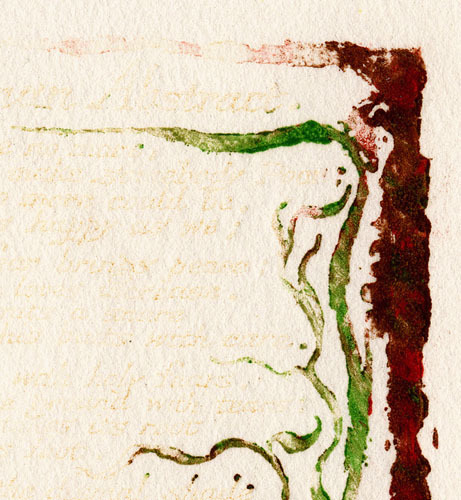 Detail of top left corner, electronically changing yellow ochre ink to red on computer, using Adobe Photoshop software, to make it easier to see that the yellow ochre ink lies on top of the green. The yellow ochre is now the darker of the two colors forming the branching tendril(s). 33. Title plate, Songs of Innocence. Line block cast from electrotype, detail of top of plate, 5 × 7.5 cm., printed 2001 by authors. 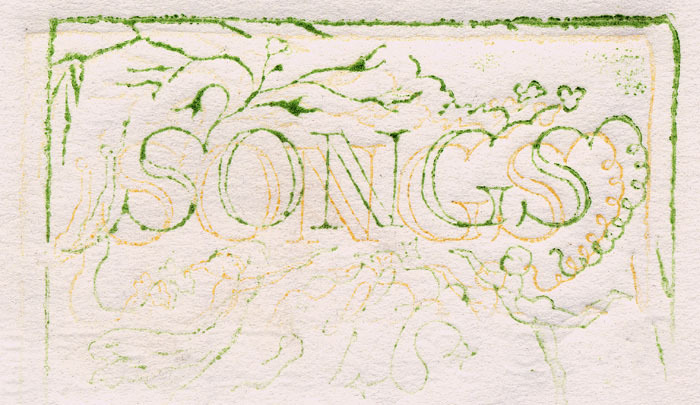 The word “Songs” was printed twice, first in green (the darker color in this monochrome reproduction) and second in yellow ochre (the lighter color), but the green appears to be on top of the yellow ochre and hence printed second. Recreates the illusion occurring in “Nurses Song” of Songs copy E (see illus. 2). Phillips believes that Blake, for his color prints, printed in ink for the first pull and in colors for the second pull through the press (98-99). Thus, he concludes (or at least assumes) that “Nurses Song” was produced in two printings, with the text in yellow ochre printed first, and the tendrils in green pigment second. This is, indeed, how it looks to the naked eye. The darker, denser color appears to lie on top of the lighter, thinner yellow ochre wherever one color crosses over the other. But this is an illusion. With a magnifying glass, one can see flecks of the yellow ochre ink lying on top of the green pigment (illus. 32a). By changing the yellow to red on a computer, this effect of the lighter color lying on top of the darker color is more easily seen (illus. 32b). The illusion itself is easy to replicate. In illustration 33, showing a plate printed by the authors, the green appears on top of the yellow, but the green was actually printed first and the yellow over it. 34a. William Blake, “Nurses Song” (Experience). Relief etching, 11.1 × 6.9 cm., etched 1794, color printed and finished in watercolors and pen and ink 1794. 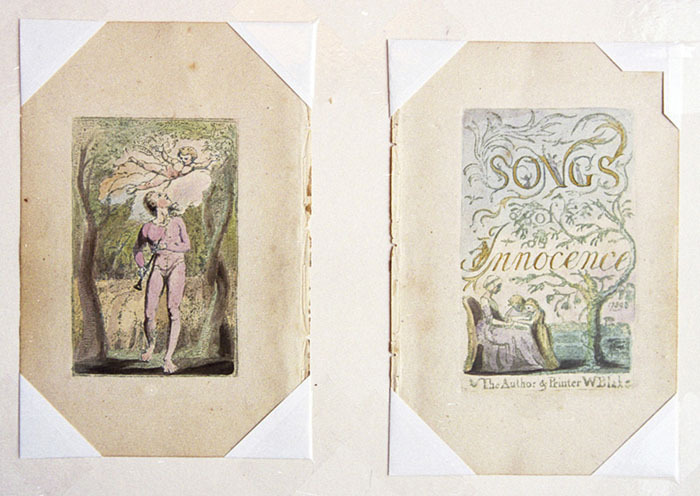 Songs of Innocence and of Experience copy E, 1789/1794, with additional washes c. 1806. Huntington Library. 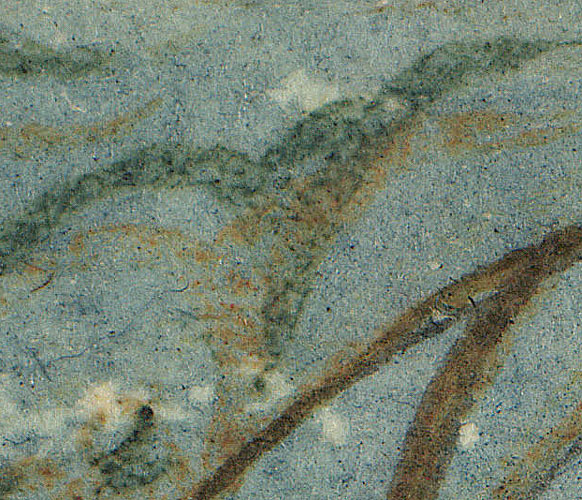 Detail of faint traces of yellow ochre ink from first printing strengthened and brought out by oversaturating the pigments on a computer using Adobe Photoshop software. In this monochrome reproduction, the first printing appears as dark, mottled fragments of letters above, and slightly to the left of, the second printing of the text, clearly visible because over-written in pen and ink. 34b. William Blake, “Nurses Song” (Experience). Relief etching, 11.1 × 6.9 cm., etched 1794, color printed and finished in watercolors and pen and ink 1794. Songs of Innocence and of Experience copy E, 1789/1794, with additional washes c. 1806. Huntington Library. 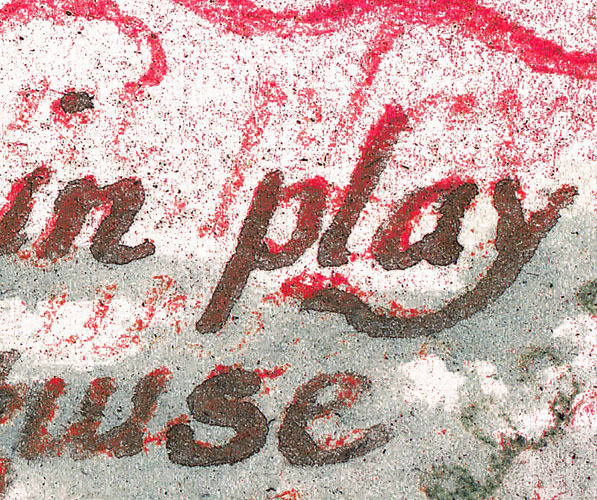 Detail of the word “play” in line 7, with traces of the text printed just above the word changed to red on a computer using Adobe Photoshop software to make those traces easily visible. paper, and traces of it can be seen under magnification. This first text becomes very apparent when the traces of yellow ochre pigments are overly saturated electronically using Adobe Photoshop software (illus. 34a). What was hardly noticeable to the naked eye becomes easily visible by magnification and computer enhancement (illus. 34b). Because the color-printed illustration looked acceptable but the text was almost invisible, Blake attempted to re-ink the text and print or stamp it into place, thereby saving himself from having to trace over the faint or illegible letters in pen and ink. But the registration was poor; the newly printed text is displaced below its first, exceedingly weak, printing. The experiment had failed; the second printing was also too lightly printed and Blake was forced to go over the second printing in pen and ink. He did not try the two-pull technique on any of the other plates in Songs of Innocence and of Experience copy E or probably ever again. At the very least, there is no extant evidence that he tried this flawed technique of two-pull printing beyond this single example. Many of the texts in books subsequently printed, such as Songs of Innocence and of Experience copy AA and its sister copy, the often-reproduced copy Z, were very light and in need of repair (illus. 28). Blake did not try to reprint the texts but wrote over them in pen and ink on the paper. 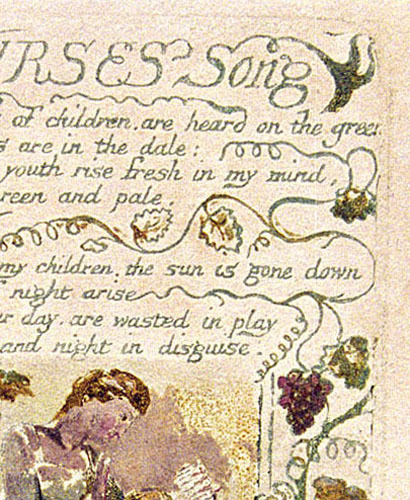 A close examination of “Nurses Song” and the other impressions in Songs of Innocence and of Experience copy E reveals that Blake inked the text area of the plates locally, presumably with small inking dabbers, and added colors to the illustration, also locally, presumably with stump brushes, adding at least a few colors with each pull, but adding ink only every other or third pull, which accounts for the inconsistent saturation of ink and the consistently solid color pigments among the impressions. These procedures and their results are easy to replicate. Illustration 35a is a facsimile plate color printed à la poupée in yellow ochre ink and in green, brown, and red pigments. The text was inked locally with a small roller and the colors applied with stump brushes. The plate was printed without reinking and recoloring to produce illustration 35b, which is noticeably lighter in ink and colors but acceptable. Illustration 35c is a third impression from the same plate with colors added but without reinking. The illustration is strong but the text is too light to be legible. This is the condition “Nurses Song” was in before Blake tried to fix it by stamping a reinked text into place. 35a. “The Human Abstract.” Line block cast from electrotype, 11.2 × 6.6 cm., color printed à la poupée in 2001 by authors, before watercolors. Detail of top right corner, first impression. 35b. Detail of top right corner, second impression pulled from the plate without its being reinked or recolored; the colors and ink are lighter and thinner than the first pull (illus. 35a). 35c. 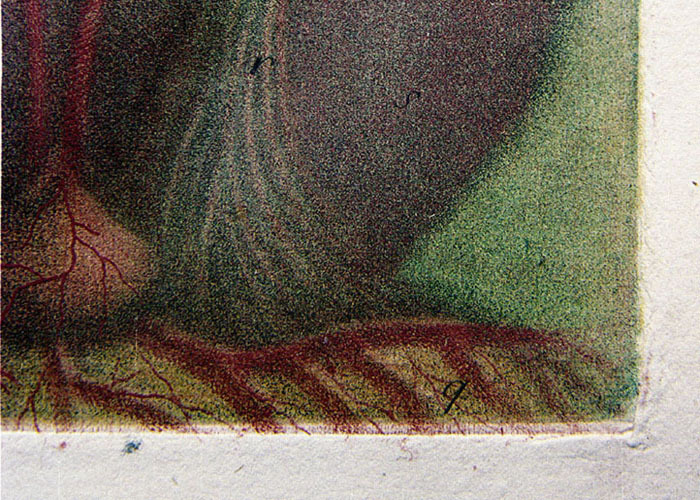 Detail of top right corner, third impression pulled from the plate without its being reinked but with colors replenished. The text is very light, analogous to those in Songs of Innocence and of Experience copy E that needed to be rewritten in pen and ink. The colors are strong. 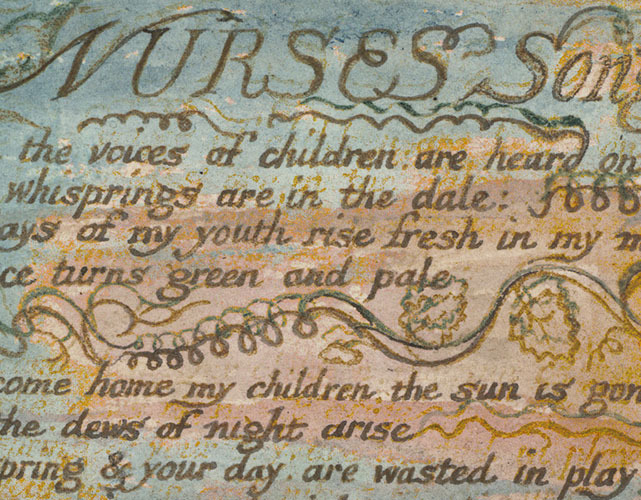 The contrast between the strong color and illegibly light text is analogous to the condition of “Nurses Song” in copy E (illus. 2) as initially printed. and to good effect—as in all à la poupée prints. If Blake had printed the plates twice, one would expect to see both overlapping of colors onto ink and gaps between colors and ink, rather then the subtle mixing of the two, because with the ink wiped from the plate, Blake would not have known exactly where to apply the colors. There is no clear division on a plate between text and illustration; tendrils, for example, run through both areas. Applying colors on a clean plate, in other words, would have been guesswork, even if the impression (pinned by the roller back at the press?) was consulted. As Landseer recognized, these “blurred and confounded” colors, the “incidental smearings and errors of the printer in colours,” can “be rectified by the author of the original picture . . . or some person of equal, and of similar powers, and capable of entering into his views” (182-83). Blake certainly was that rare individual, a printer who was also a painter, who thought in terms of the whole process—from blotting and blurring to organizing the “chaotic confusion” (Landseer 182) with firm bounding lines. He had to, since color printing, especially from both levels of the plate, could obliterate form, as is demonstrated by the unfinished impressions of The Book of Urizen plates 1 and 5 in the Yale Center for British Art, and the sequentially printed proofs of plate 25 in the Fitzwilliam Museum and Beinecke Library (illus. 12-13). It was a two-step process not unlike J. M. W. Turner’s on Varnishing Day in the Royal Academy, when he would transform a roughly painted canvas into a finished work of art in a few hours, or Alexander Cozen’s “New Method,” in which the initial form was indeterminate blots and blurs given meaning through line. Blake must have been thinking in terms of the whole process—printing the entire image in ink and colors and finishing in water colors and pen and ink. Why would he try to divide and sanitize the process by printing the two parts separately? 36. 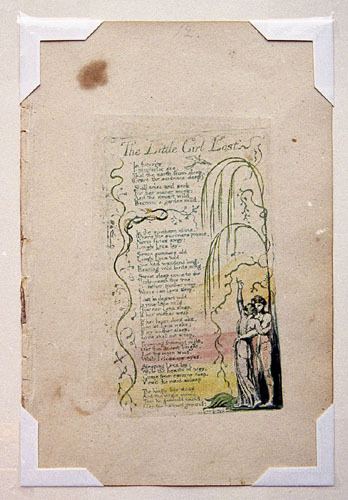 William Blake, “The Lilly.” Relief etching, 11.0 × 7.0 cm., etched 1794, color printed and finished in watercolors 1794. Songs of Innocence and of Experience copy E, 1789/1794, with additional washes c. 1806. Huntington Library. 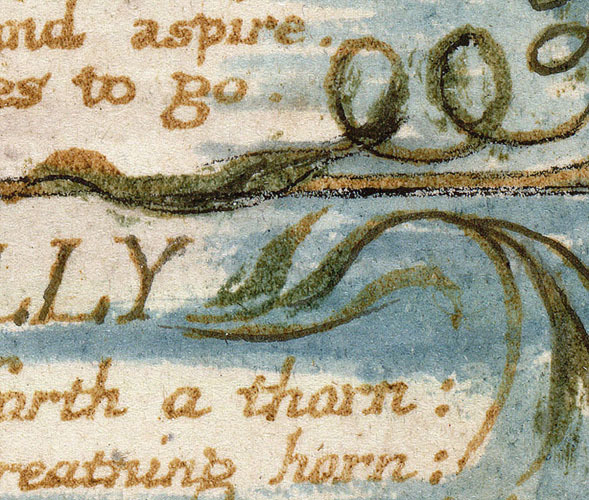 Detail of the green color (the darker tone in this monochrome reproduction) and yellow ochre ink (the lighter tone) mixing in text and tendrils as they do in “Nurses Song” in copy E—characteristic of à la poupée printing. the Marriage plates for Urizen, and in the following year for The Song of Los, The Book of Los, and The Book of Ahania used a variety of plate sizes. Can a color print be produced by printing a relief-etched plate two times, one impression over the other on the same sheet of paper? Yes. The authors have done it, but it requires behaving very differently from Blake: thoroughly wiping ink and colors between pulls, and either following guidelines four times per impression with extreme care and precision or using sheets longer than those we know he used. Even then, traces of the second printing are never completely erased. One does not need to resort to recreations, though, to make the case against the two-pull theory. Wiping ink and colors between pulls is inefficient, and we know from the visual evidence of the prints themselves that Blake did not do it. Nor did he employ the mechanism of bottom sheets necessary for dual registration. The white lines along the escarpments between relief plateaus and etched valleys indicate that color and ink were printed simultaneously. The two-pull theory requires us to believe the impossible, that the Blakes perfectly registered over 650 prints in 1794-96 while at the same time misaligning their plates relative to the edges of the paper. And it requires us to believe that Blake’s “skillful carelessness” was an inauthentic ploy to fool us by disguising his unsurpassed skill in the mechanics of registration. But the main reason for rejecting the two-pull theory is that modes of production may fall below the threshold of vision but cannot hide from magnification and computer enhancement. Like old bones to the forensic scientist, prints give up their secrets if you know where and how to look. This is not a situation in which there is evidence on each side of the issue, nor is it a matter of textual interpretation in which the force of one’s rhetoric makes one view more persuasive than another. This is a matter of material facts and physical events. Either Blake used two-pull printing or he did not. All the material evidence indicates that he did not, with the single extant exception (“Nurses Song”) discussed in detail above. It is impossible for Blake to have regularly used two-pull printing. Phillips has misread his key pieces of evidence and ignored, or rejected without explanation, what did not fit his theory, including published counter-arguments. The full evidence provided by Blake’s technique and the illuminated prints themselves does not support his interpretation. What goes unexplained in the two-pull theory, however, is easily explained by à la poupée printing without bottom sheets, the most direct contact Blake as artist could have had with the plate and image-making process. And this brings us to William of Occam’s famous razor: the simplest explanation is usually correct. We have found this principle an accurate guide in all our investigations of Blake’s graphic methods. The verbal content of Blake’s illuminated books is fearfully complex, but we cannot extrapolate from that observation that his graphic techniques must be equally complicated. For some modern commentators, the idea that illuminated printing was for Blake nearly as direct and autographic as writing and drawing on paper is somehow to underestimate his genius.28↤ 28. John Updike noted in his review of the Metropolitan Museum Blake exhibition that Blake “laboriously [wrote] his self-published poems in minute backward lettering” (9). It does not matter what Blake said of his technique in his 1793 prospectus “To The Public” (E 692-93) because it cannot be that simple and straightforward. The technique must be as intricate as his mythopoesis. But precision in line engraving and love of complex ideas do not automatically lead to precision in printing or love of mechanically registering one object to another. Advocating a very complex way to produce color prints may seem Blakean, but it is actually Urizenic and at the expense of the artist Blake. To fail to believe that Blake color printed in a very complicated manner, Phillips argues, is to somehow diminish his skills as a printmaker.29↤ 29. Phillips writes of the “failure to appreciate Blake’s achievement, and the time and skill that it required to accomplish. . .” (95). We argue just the opposite. We do Blake a great disservice by imagining him to be simply a better-than-average conventional printer obsessed with exacting and machine-like procedures when more efficient, begin page 101 | ↑ back to top direct, immediate, and artistically exciting ways of achieving the same results were available to him. Indeed, Blake’s color printing, even more than relief etching, fully realized Blake’s objective of combining in one seamless process printmaker, poet, and painter. Blake surely would have agreed with Hayter, who thought multiple-pull printing was “typical of the practice of a skilled artisan rather than a process by which the original thought of the artist becomes visible directly in a print” (59). Moreover, we contend that the two-pull hypothesis is refuted by the fact that all of Blake’s color-printing effects can be produced in one pull, as the color printed facsimiles of “The Human Abstract” demonstrate (illus. 35a-c), and by the inherent contradictions of the hypothesis. Blake’s very idea of prints, as reflected in his not producing correctly registered, similarly sized, uniformly legible, identical looking color and colored prints in large print runs, is evidence enough to indicate that Blake did not prize mathematical precision. Blake was forward looking—not to the mechanized color printing of the mid-nineteenth century, but rather to the monotypes, open-etched plates, multileveled printing, and painter-printmakers of the next two centuries. Indeed, Blake anticipates modern practices and ideas of the printmaker as artist. Both his writings and his graphic works indicate that Blake sought a more direct connection among thought, image, and object than was offered by reproduction, repetition, and replication. Phillips recognizes that the two-pull theory has consequences extending well beyond the exposition of Blake’s graphic practices. As we noted earlier, he does not pursue the matter; we accept his implicit invitation to do so. Let us assume that Blake did use two pulls to produce each of his color prints. What sort of Blake, as an artist and as a writer on the arts, would this assumption lead us toward? We would encounter a man who favored precision over variation, for two-pull printing relies heavily on the former and bars the printer from the latter. He would base his activities on the arts of memory rather than imagination, for no printing technique provides a better externalization of returning to a prior activity (first pull) and repeating it (second pull). He would emphasize the mechanical over the autographic.30↤ 30. See Le Blon’s statement, quoted earlier, about his “reducing the Harmony of colouring in painting to Mechanical Practice, and under infallible Rules” (iv). He would be much concerned with the division of images and labor into discrete segments at the expense of any notions of a seamless unity between invention and execution. Fitting plate to the bed of the press and paper to plate would be among his major endeavors. In that pursuit, freedom would have to be restrained, as it must be in all crafts that emphasize imitating/repeating over creating.31↤ 31. Reconstructing an illustrated text by dividing it into text and illustration and invisibly reconstituting these parts is not characteristic of Blake, an artist/poet for whom words and images are elements in a unified visual composition. Moreover, Blake appears often to go out of his way not to conceal his hand in the creative process. Rather than dividing the image into sketch and finished work in his water color drawings, Blake conflated the two stages, as his unerased and often vigorous pentimenti reveal (e.g., the illustrations to Thomas Gray and Dante). Two-pull printing would have harnessed Blake to a dull round of fitting plate to paper again and again, measuring both with minute precision, and deploying mechanical equivalents of memory and imitation to convert the crooked roads of his genius—indeed, his literally crooked plates—to roads straighter than those ever created by any other printmaker. The expressive energies with which he invented and etched his images would have been divided from the final, encompassed and restricted, stages of their execution. Advocates of the two-pull theory of Blake’s color printing will no doubt wish to draw their own portrait of Blake according to the implications of their views and to the incompatibility between those implications and the statements quoted above.32↤ 32. It is of course possible for practice and theory to run at cross-purposes; see for example Essick, “Production,” for contradictions between the painterly tendencies in Blake’s nineteenth-century prints and his linear aesthetic. In the present instance, however, we believe that practice gave rise to theory, and that this genetic relationship accounts for the consistencies between Blake’s graphic techniques and his comments on memory, measurement, repetition, and imagination quoted here. We believe that our investigations of Blake’s techniques in light of the facts provided by the illuminated prints themselves can lead only to the abandonment of the two-pull theory and to a renewed appreciation of Blake’s art of one-pull color printing. Anon. Sculptura-Historica-Technica: or the History and Art of Ingraving [sic]. London: S. Harding, 1747. Bentley. Blake Records. Oxford: Clarendon Press, 1969. Bentley. Blake Records Supplement. Oxford: Clarendon Press, 1988. Blake, William. The Complete Poetry and Prose. Newly Revised Edition, ed. David V. Erdman. New York: Doubleday, 1988. Cited throughout this essay as “E” followed by page number. Burch, R. M. Colour Printing and Colour Printers. London: Pitman, 1910. Butlin. “The Physicality of William Blake: The Large Color Prints of ‘1795.’” Huntington Library Quarterly 52 (1989): 1-17. Butlin. William Blake. Exhibition catalogue, Tate Gallery. London: Tate Gallery, 1978. Butlin, Martin, and Ted Gott. William Blake in the Collection of the National Gallery of Victoria. Introduction by Irena Zdanowicz. Melbourne: National Gallery of Victoria, 1989. Carretta, Vincent. Review of Phillips and Hamlyn and Phillips. Eighteenth-Century Studies 34 (2001): 440-45. Cohn, Marjorie B. Wash and Gouache: A Study of the Development of the Materials of Water Color. [Cambridge, Mass. ]: Center for Conservation and Technical Studies, Fogg Art Museum, 1977. Crozat, Joseph Antoine. Description sommaire des desseins des grands maistres d’Italie, des Pays-Bas et de France, du cabinet de feu M. Crozat. Paris: Mariette, 1741. Dawson, John, ed. The Complete Guide to Prints and Printmaking Techniques and Materials. Oxford: Phaidon Press Limited, 1981. Dörrbecker, D[etlef]. W. Commentary in William Blake, The Continental Prophecies. Blake’s Illuminated Books vol. 4, General Editor David Bindman. London: The William Blake Trust/The Tate Gallery, 1995. [Dossie, Robert]. The Handmaid to the Arts. 2 vols. London: J. Nourse, 1758. Eaves, Morris. William Blake’s Theory of Art. Princeton, N. J.: Princeton University Press, 1982. Essick, Robert N. “Blake and the Production of Meaning.” Blake in the Nineties, ed. Steve Clark and David Worrall. Houndmills and London: Macmillan Press, 1999. Pp. 7-26. Essick. The Separate Plates of William Blake: A Catalogue. Princeton: Princeton University Press, 1983. Essick. William Blake Printmaker. Princeton: Princeton University Press, 1980. Faithorne, William. The Art of Graveing and Etching. 2nd ed. London: A. Roper, 1702. Friedman, Joan M. Color Printing in England 1486-1870. [New Haven]: Yale Center for British Art, 1978. Gascoigne, Bamber. How to Identify Prints. London: Thames and Hudson, 1986. Gautier D’Agoty, Arnaud Eloi. Cours complet d’anatomie. Nancy: J. Le Clerc, 1773. Gautier D’Agoty, Jacques Fabian. Anatomie de la tête, en tableaux imprimés. Paris: Gautier, 1748. Gautier D’Agoty, J. F. Myologie complette en couleur et grandeur naturelle. Paris: Gautier, 1746. Gautier D’Agoty, J. F. Observations sur l’histoire naturelle, sur la physique et sur la peinture. 6 vols. Paris: Delaguette, 1752-55. Gilchrist, Alexander. The Life of William Blake. Ed. W. Graham Robertson. London: John Lane, 1907. Hamlyn, Robin, and Michael Phillips. William Blake. Exhibition catalogue, Tate Britain, London. London: Tate Publishing, 2000; New York: Harry N. Abrams, 2001 (with a supplement on the Metropolitan Museum version of the exhibition). Hardie, Martin. English Coloured Books. London: Methuen, 1906. Ivins, William M., Jr. Prints and Visual Communication. London: Routledge and Kegan Paul, 1953. Jackson, John Baptist. An Essay on the Invention of Engraving and Printing in Chiaro Oscuro. London: A. Millar et al., 1754. Landseer, John. Lectures on the Art of Engraving. London: Longman, Hurst, Rees, and Orme, 1807. Le Blon, Jacques Christophe. Coloritto; or the Harmony of Colouring in Painting: Reduced to Mechanical Practice, under Easy Precepts, and Infallible Rules; Together with Some Coloured Figures, in order to Render the Said Precepts and Rules Intelligible, not only to Painters, but even to All Lovers of Paintings. London: n.p., 1725. Lilien, Otto M. Jacob Christoph Le Blon, 1667-1741: Inventor of Three- and Four-Colour Printing. Stuttgart: A. Hiersemann, 1985. Lister, Raymond. Infernal Methods: A Study of William Blake’s Art Techniques. London: G. Bell & Sons, 1975. [Macklin, Thomas]. Poetic Description of Choice and Valuable Prints, Published by Mr. Macklin, at the Poets’ Gallery, Fleet Street. London: Printed by T. Bensley, 1794. Phillips, Michael. 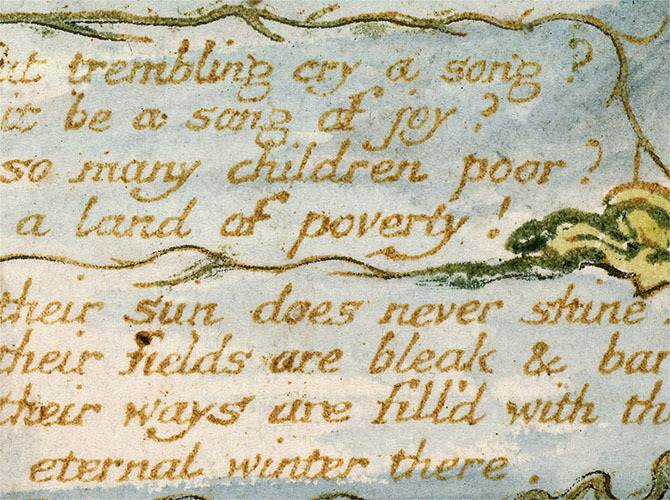 William Blake: The Creation of the Songs of Innocence and of Experience from Manuscript to Illuminated Printing. London: The British Library, 2000. Distributed in the US by Princeton University Press. Romano, Clare, and John Ross. The Complete Printmaker. New York: Macmillan Press, 1972. Smith, K. E. Review of Phillips. The Blake Journal No. 6 (2001): 76-78. Stedman, John Gabriel. Narrative, of a Five Years’ Expedition, Against the Revolted Negroes of Surinam. 2 vols. London: J. Johnson and J. Edwards, 1796. Todd, Ruthven. William Blake the Artist. London: Studio Vista, 1971. Updike, John. “Therefore I Print.” New York Review of Books (17 May 2001): 9-12. Viscomi. “Recreating Blake’s Illuminated Prints: The Facsimiles of the Manchester Etching Workshop.” Blake/An Illustrated Quarterly 19 (1985): 4-23.